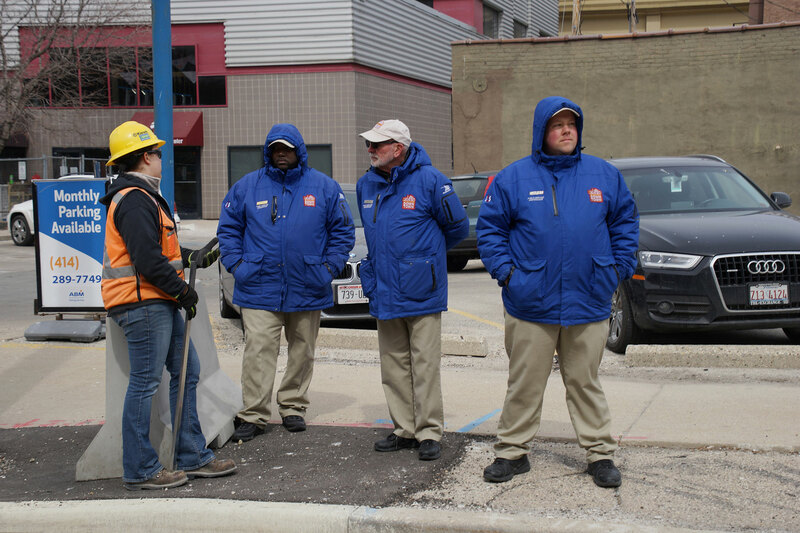 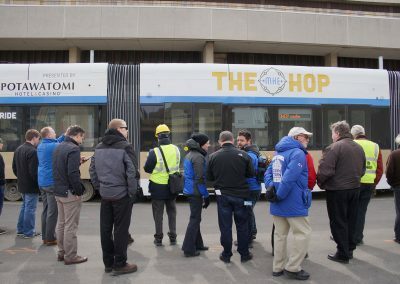 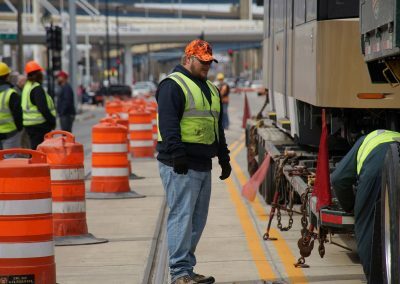 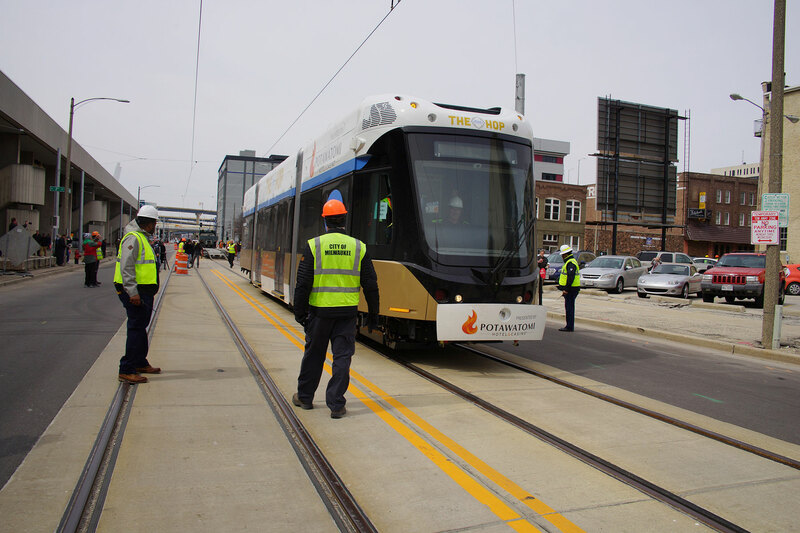 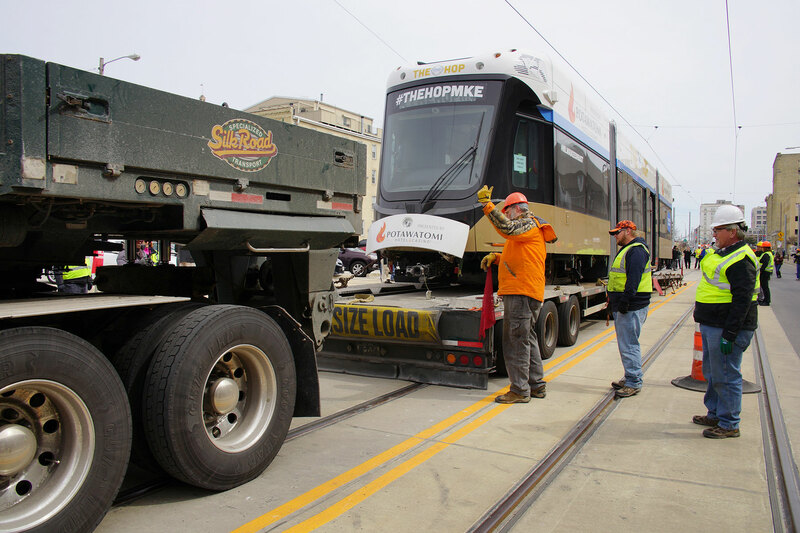 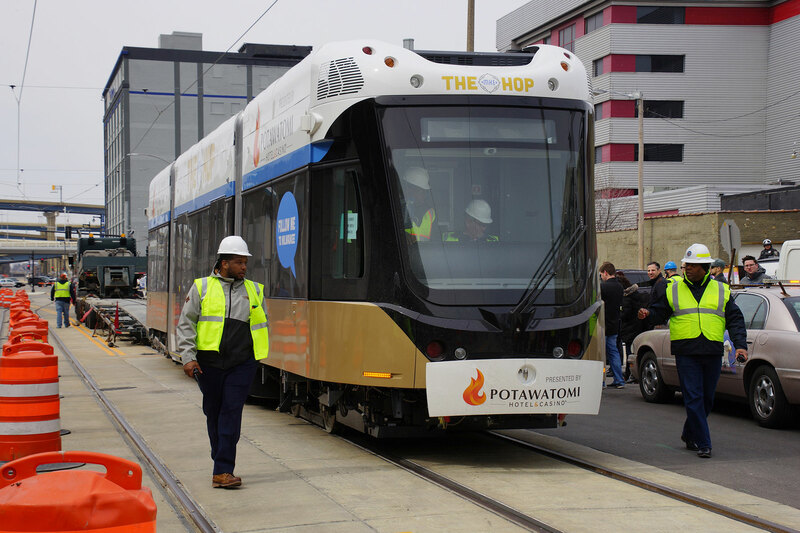 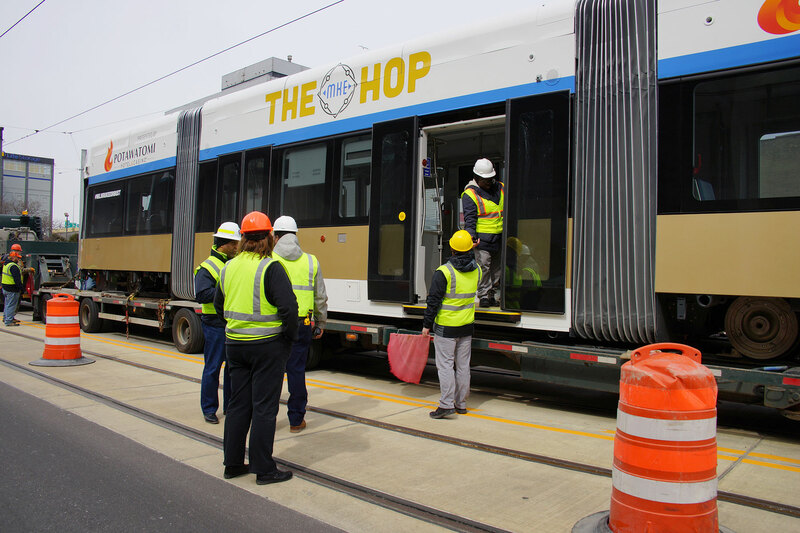 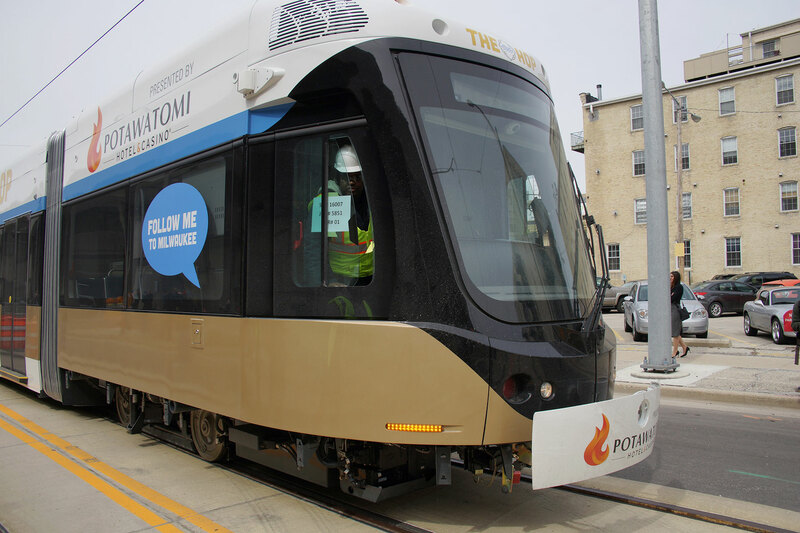 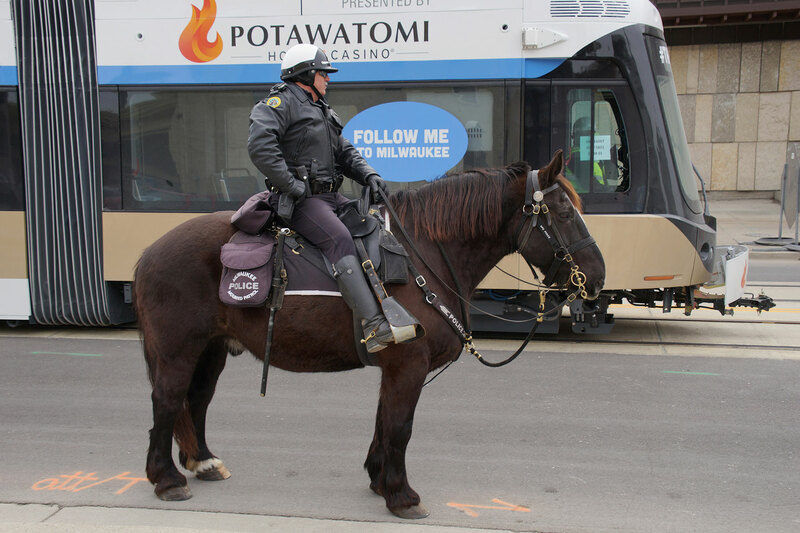 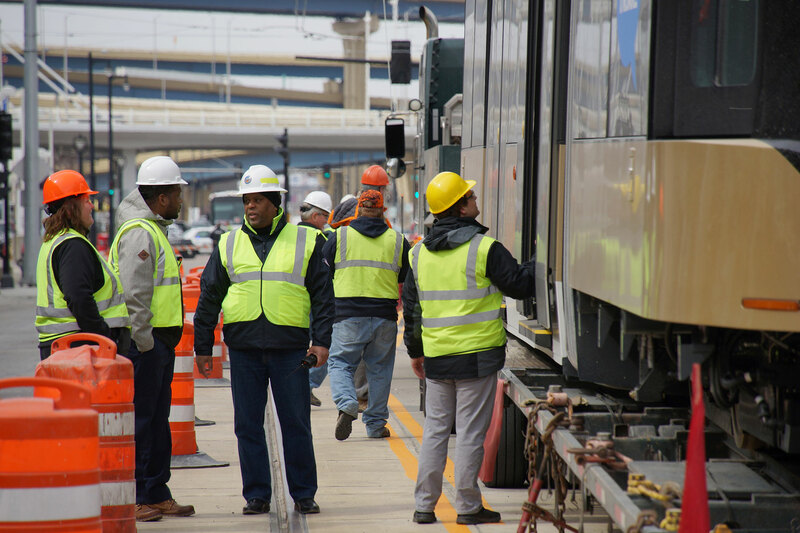 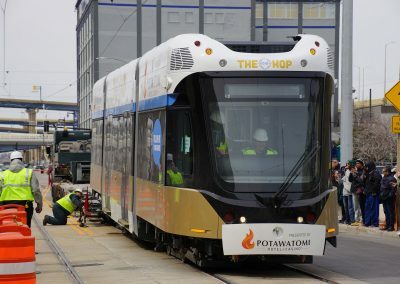 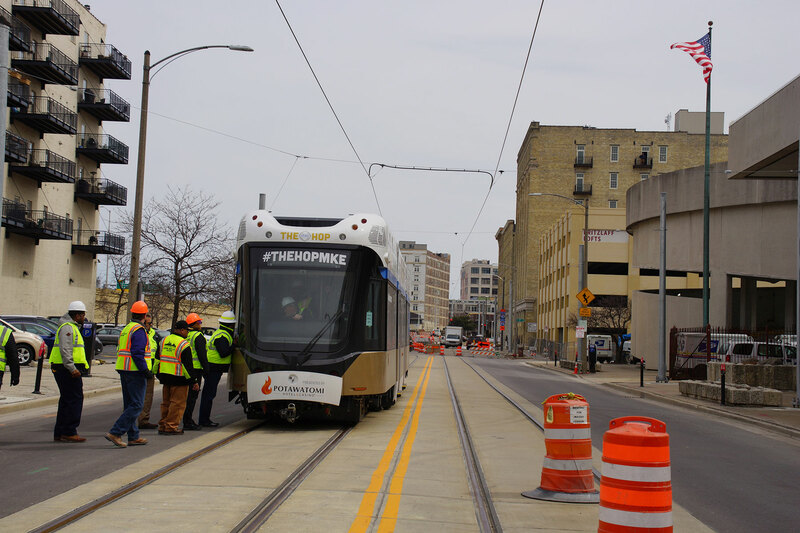 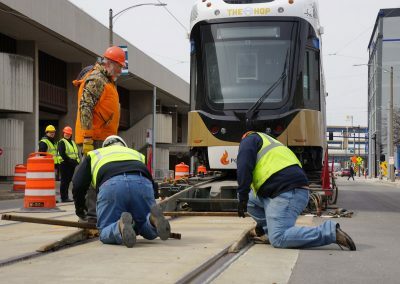 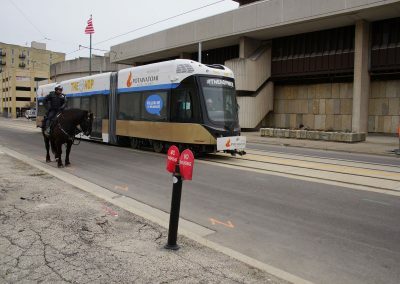 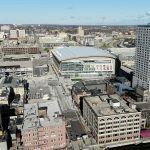 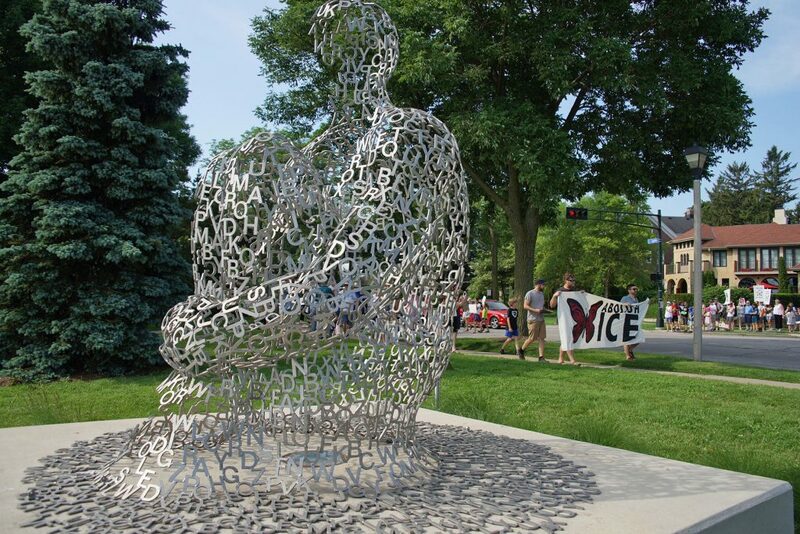 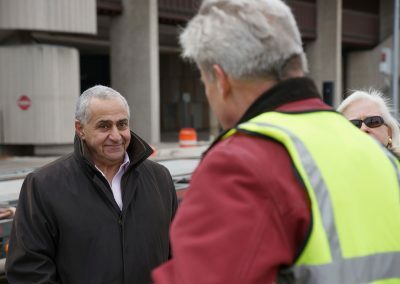 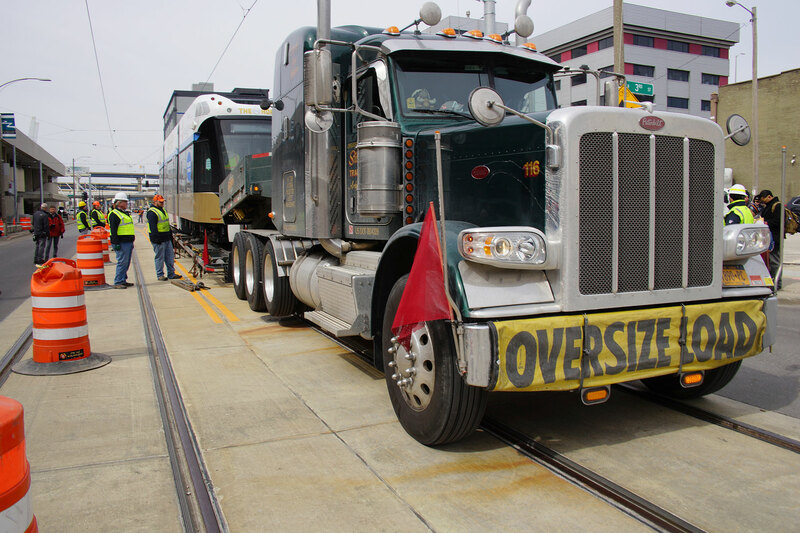 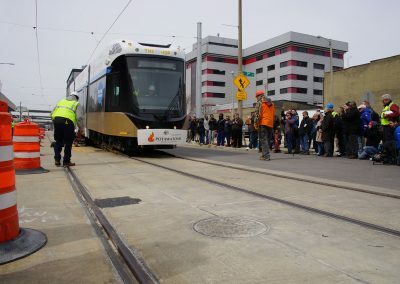 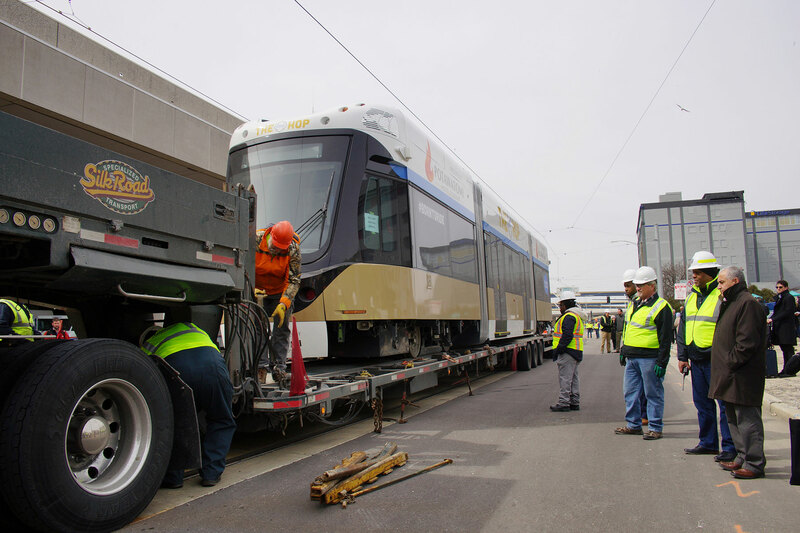 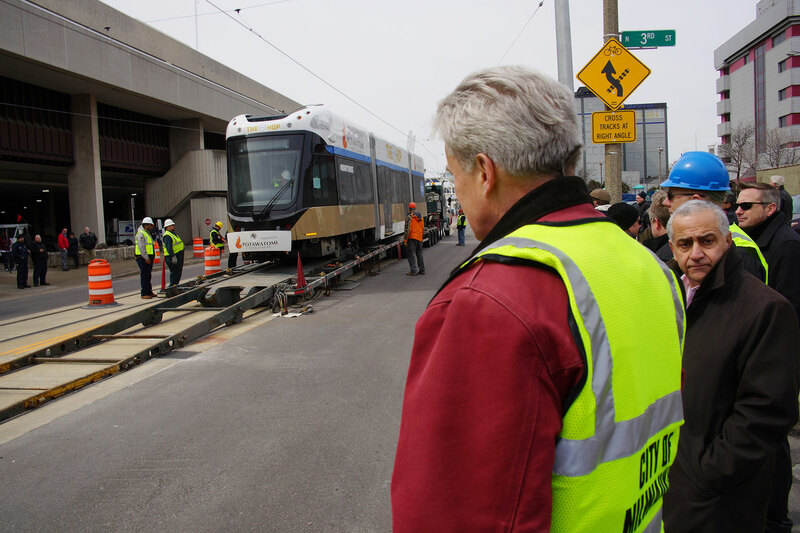 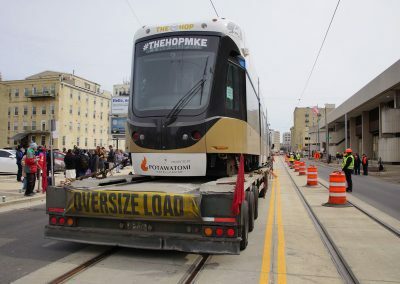 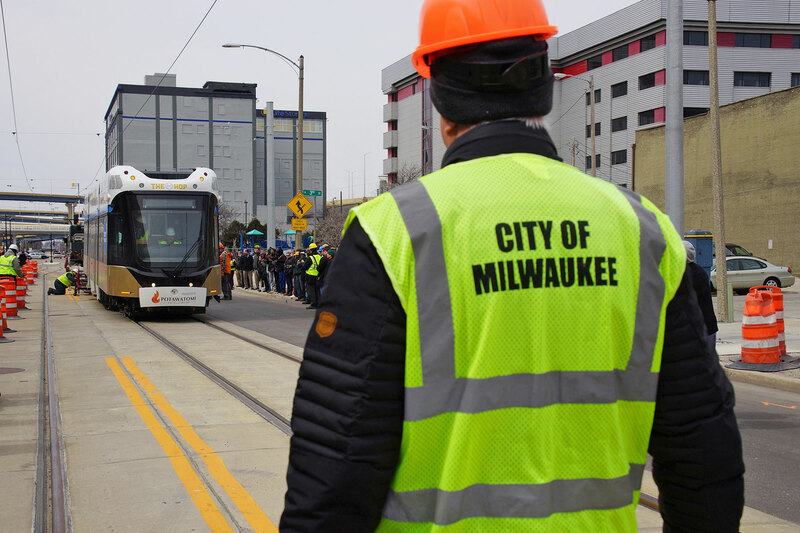 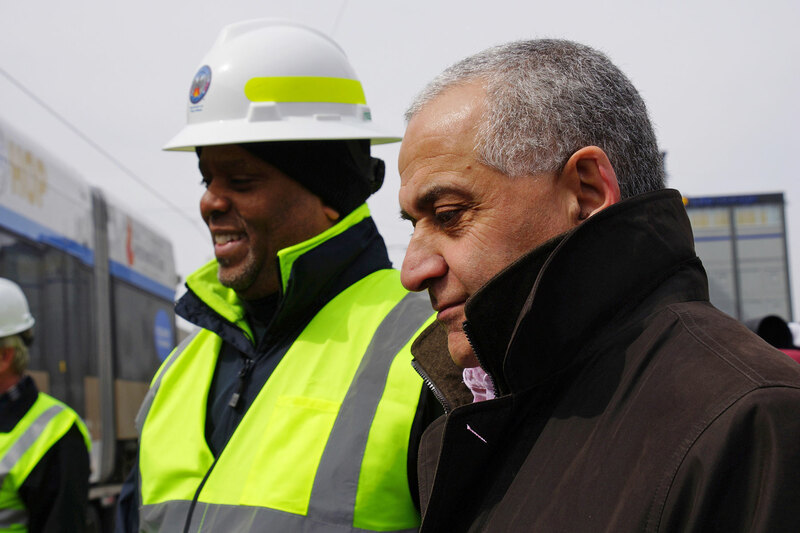 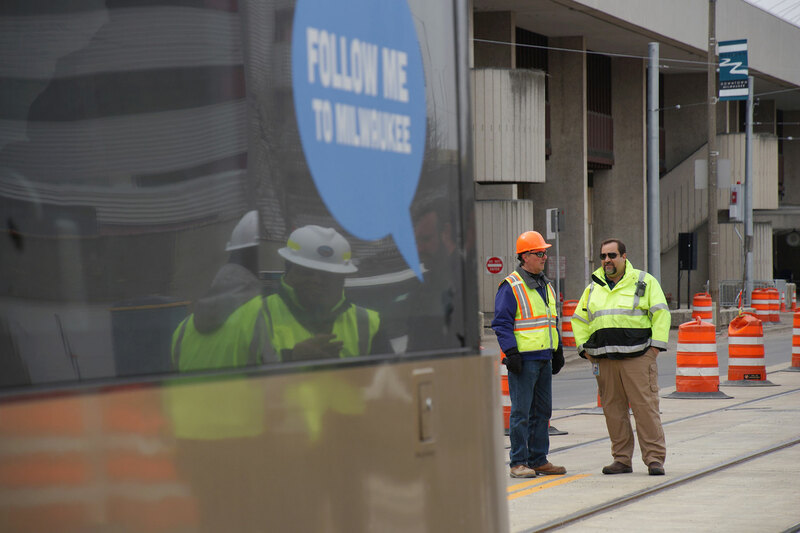 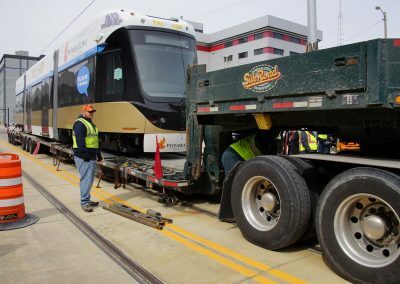 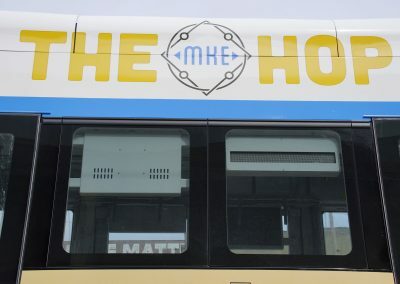 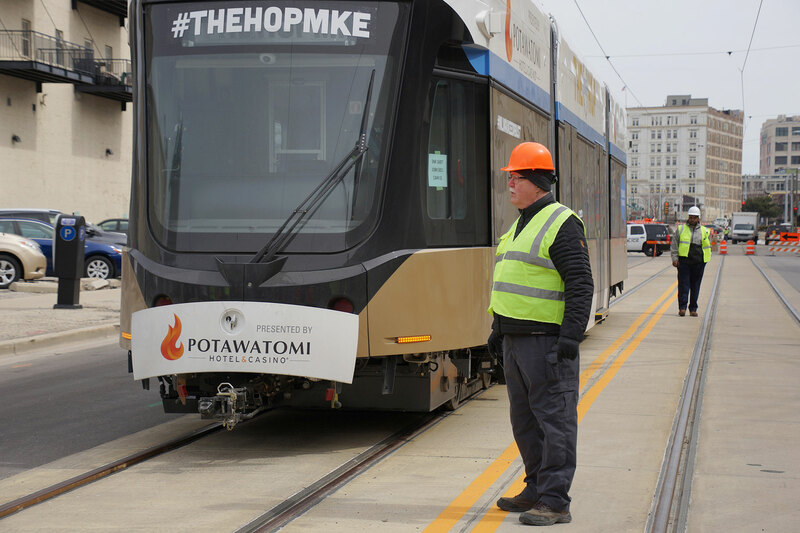 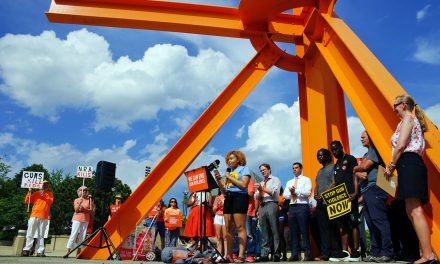 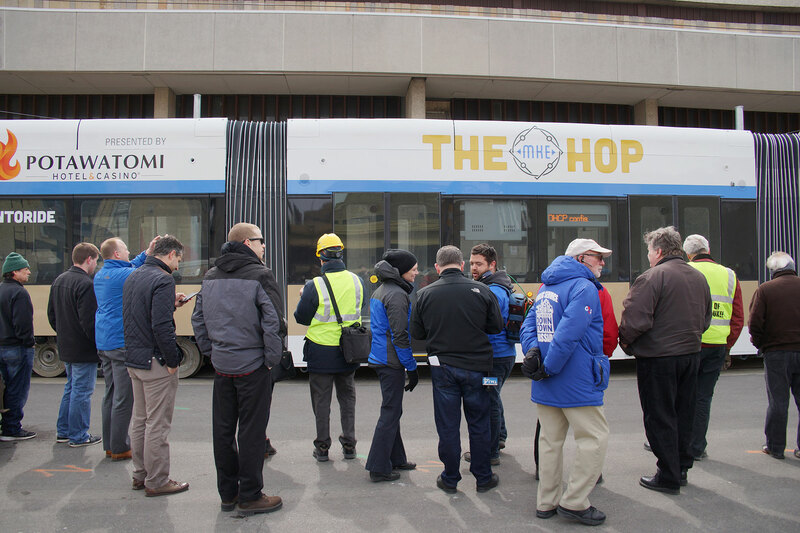 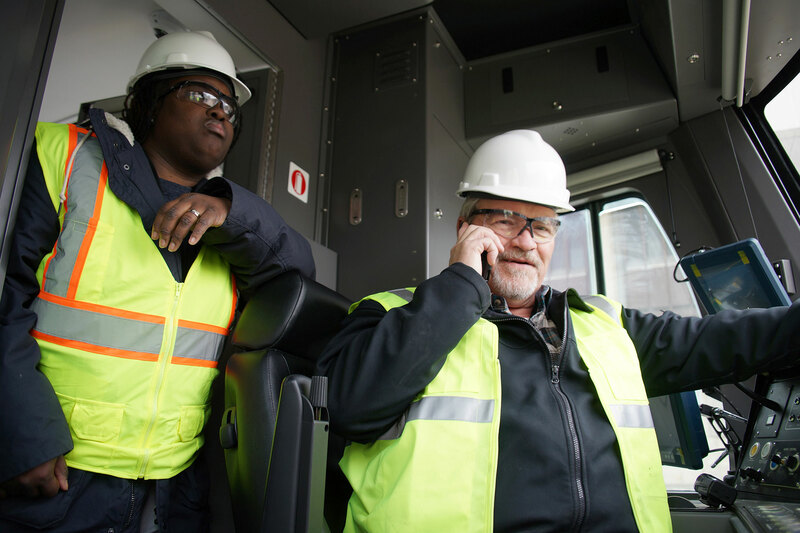 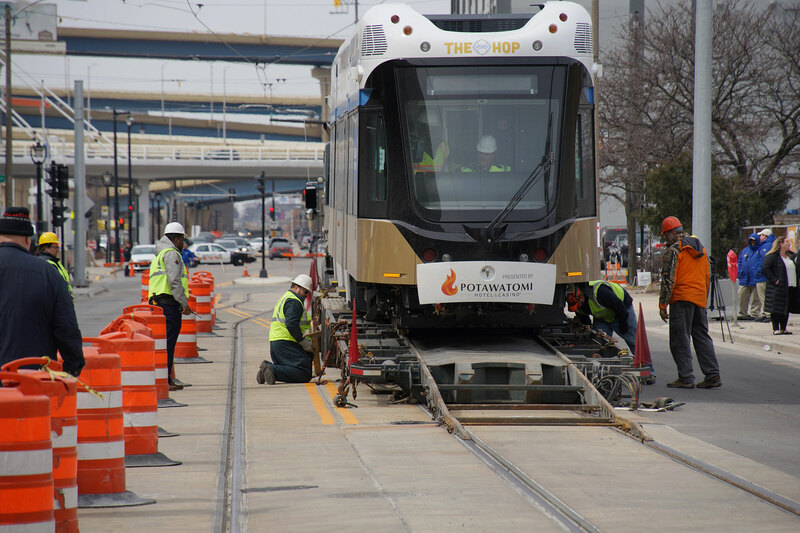 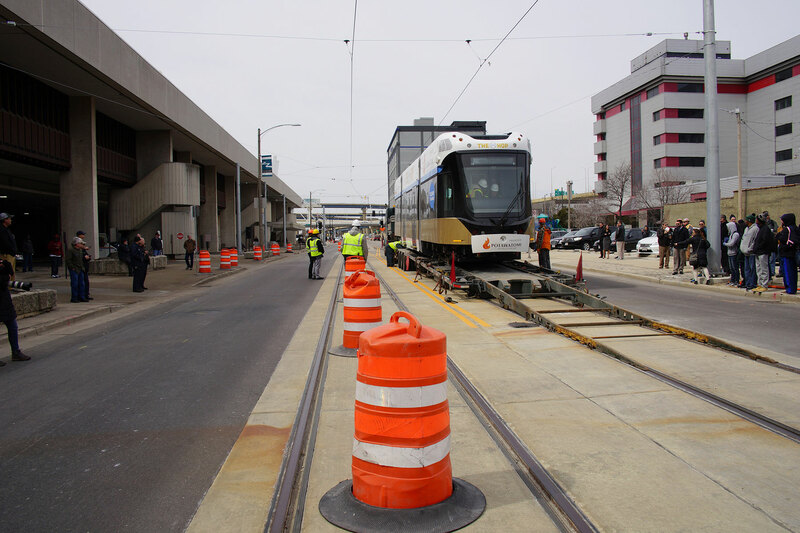 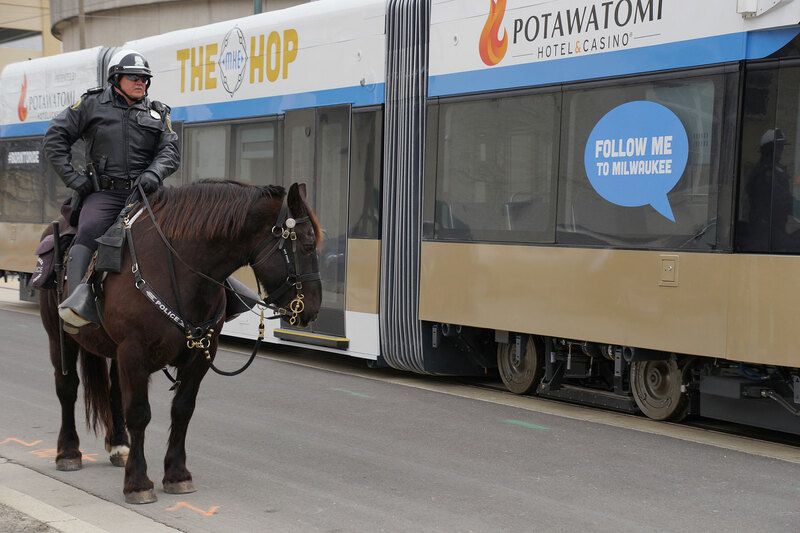 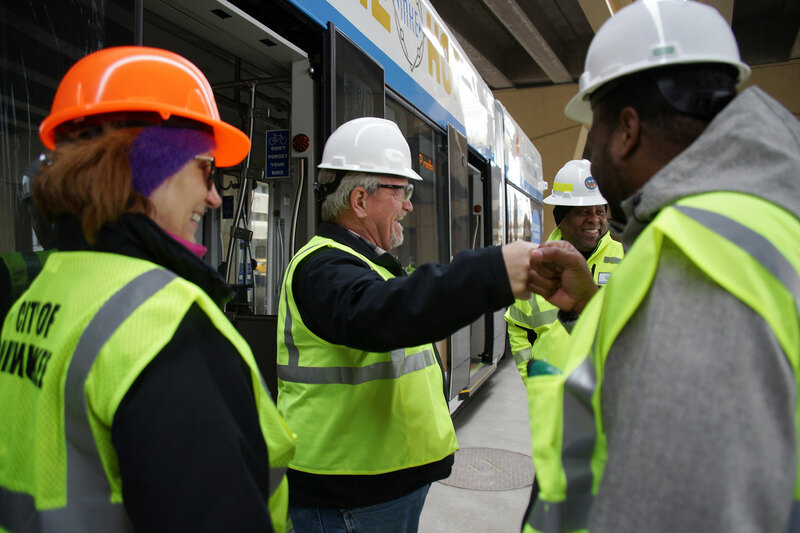 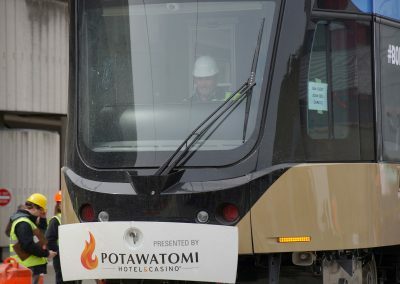 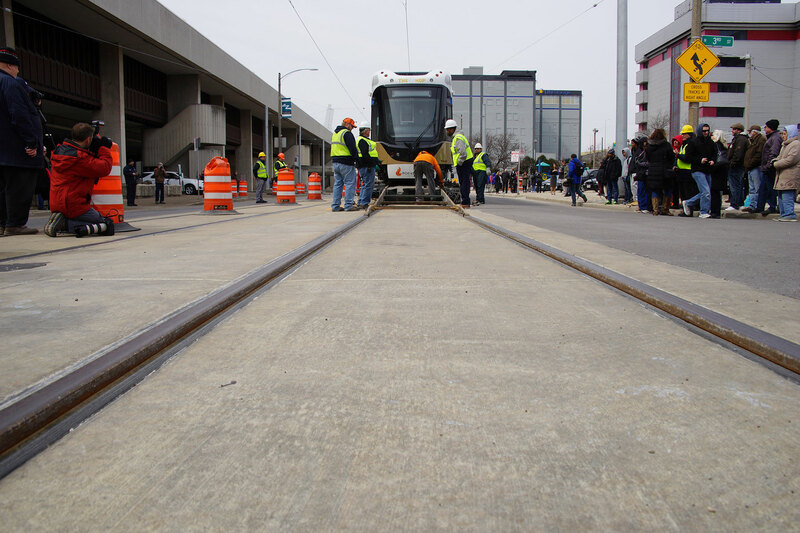 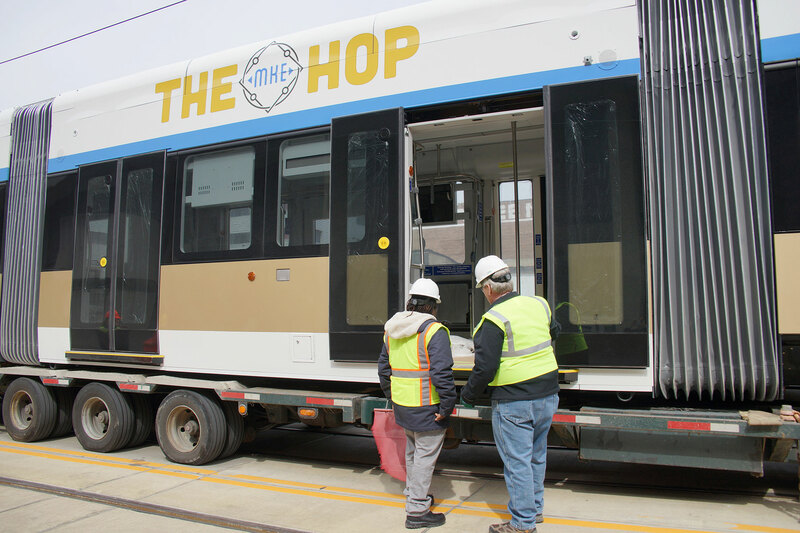 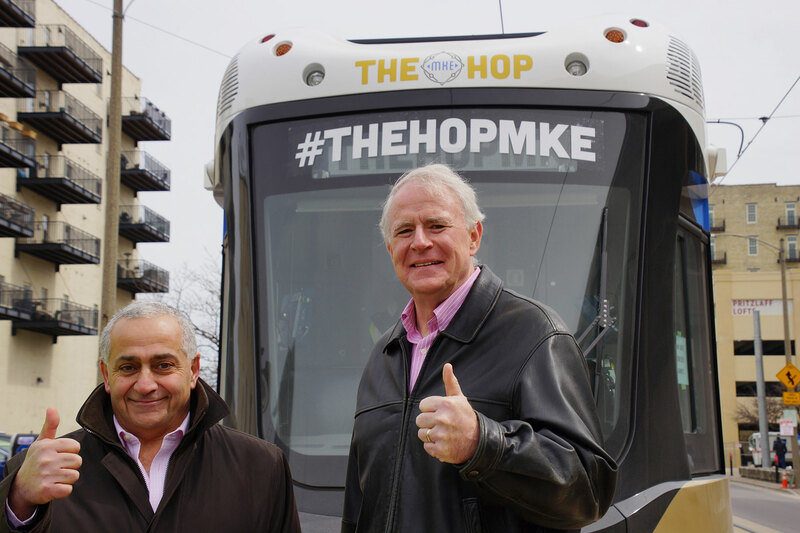 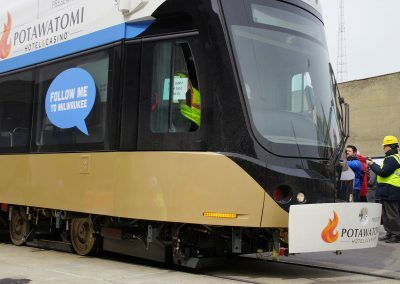 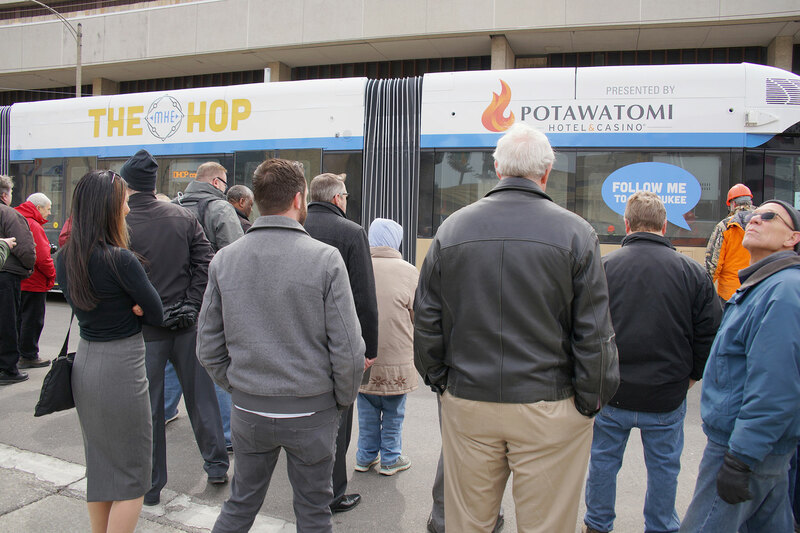 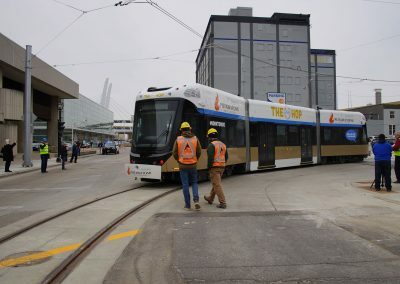 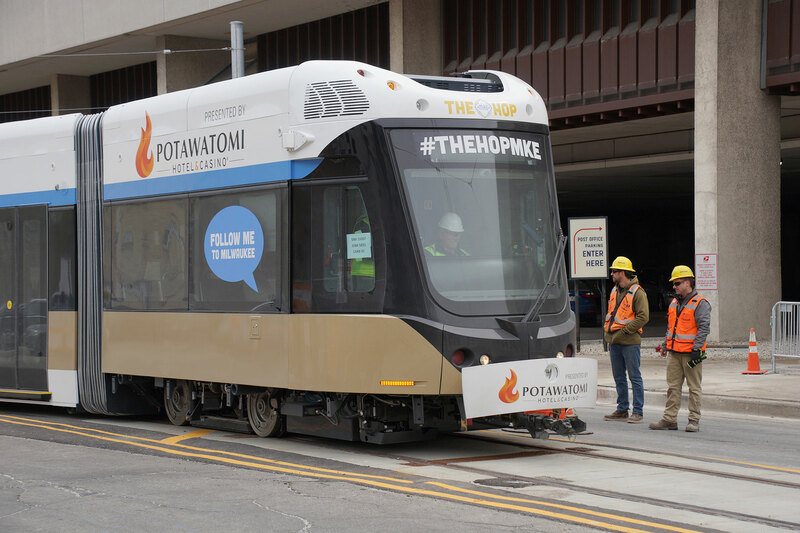 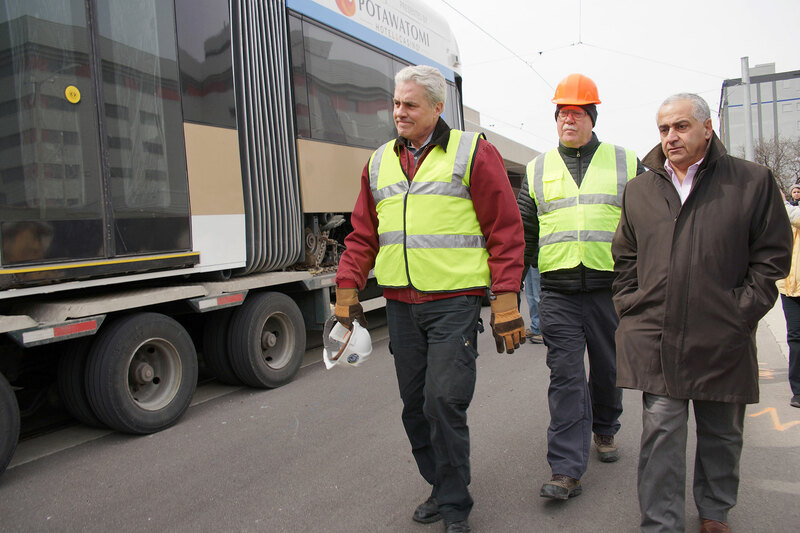 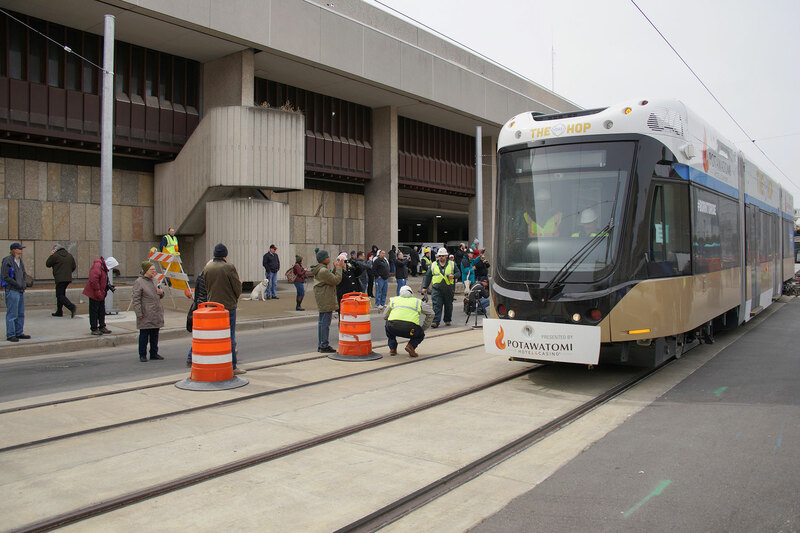 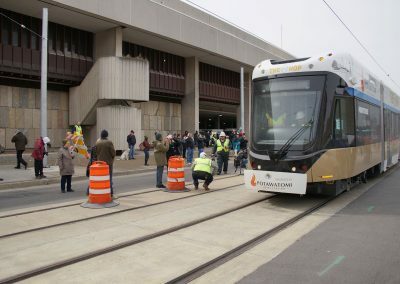 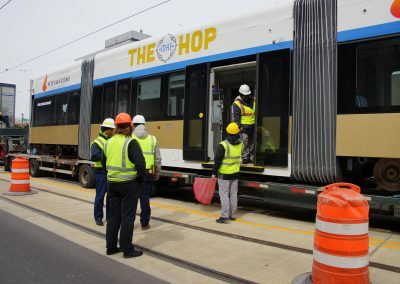 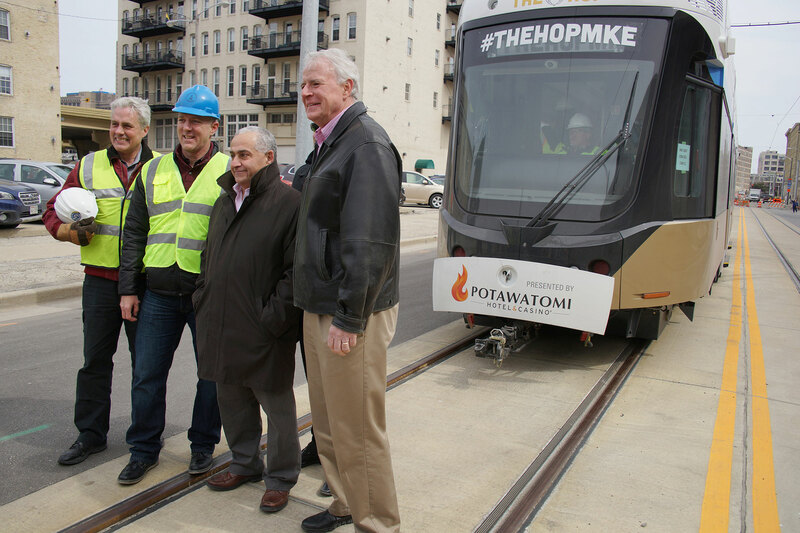 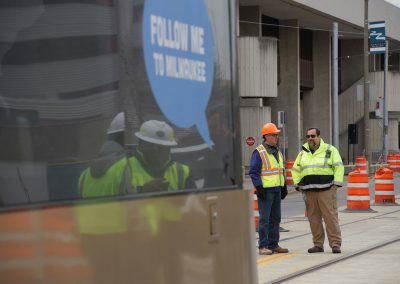 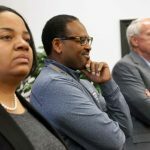 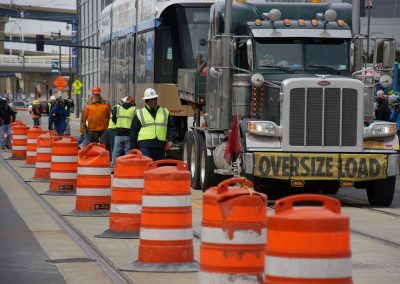 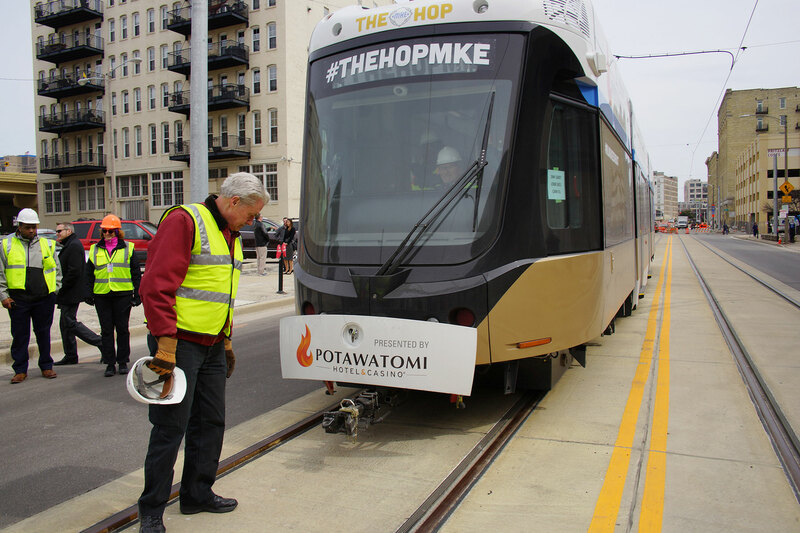 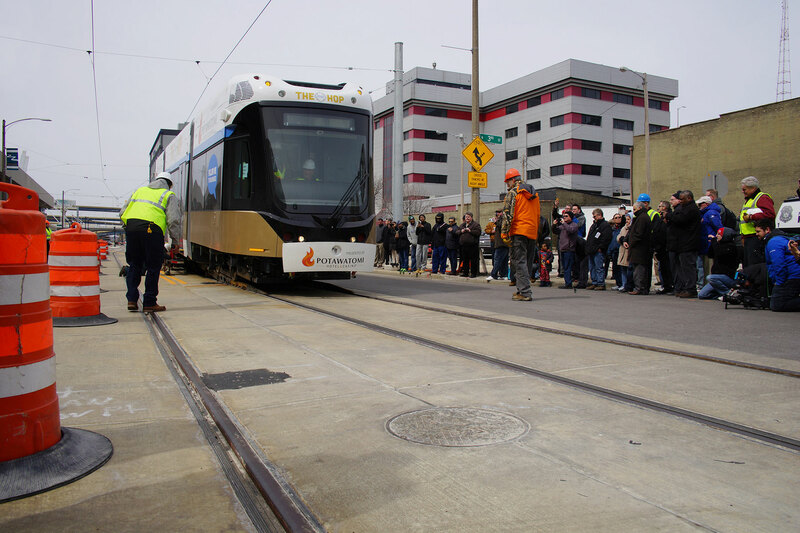 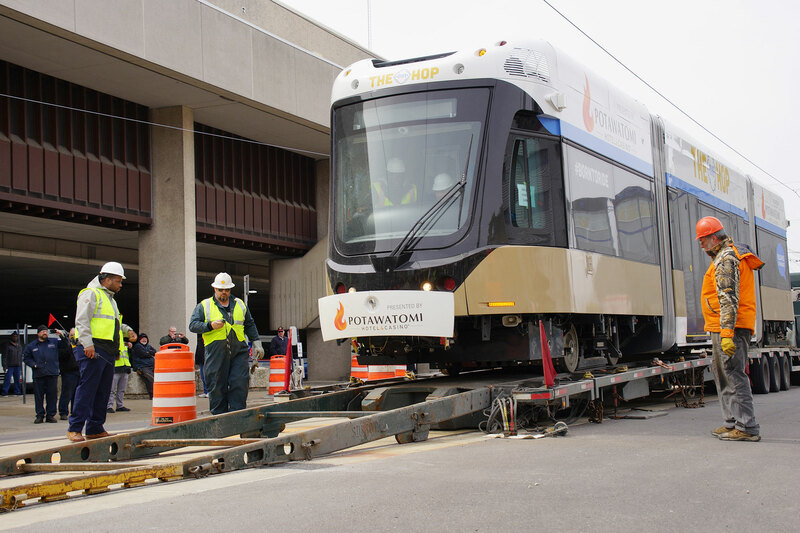 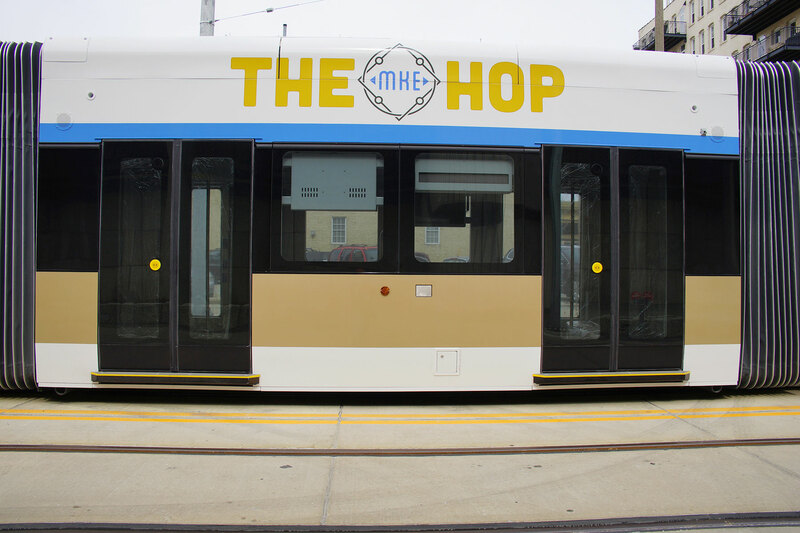 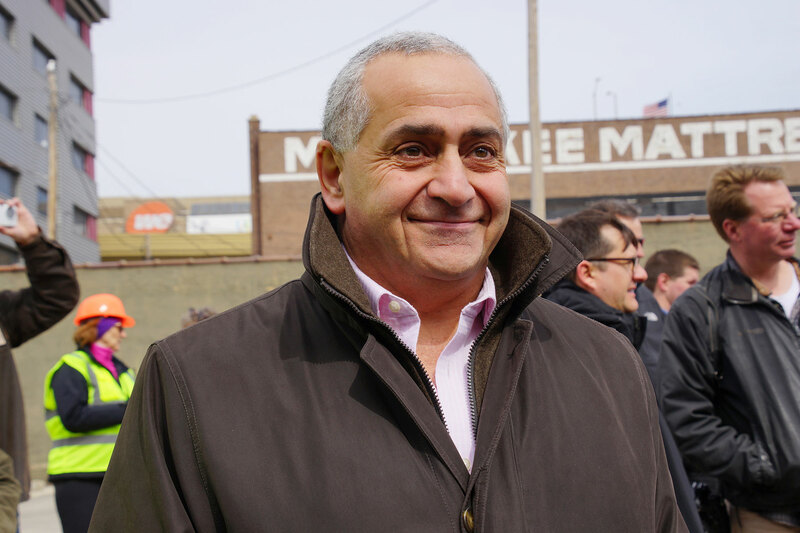 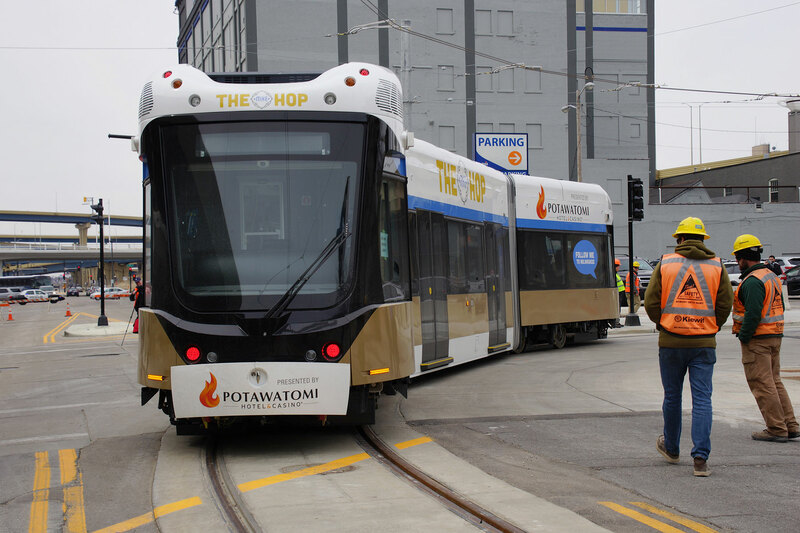 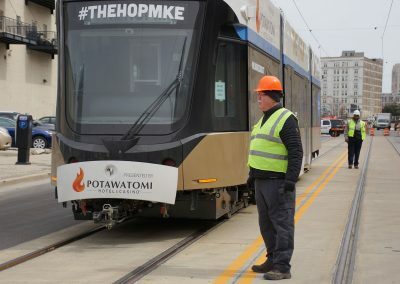 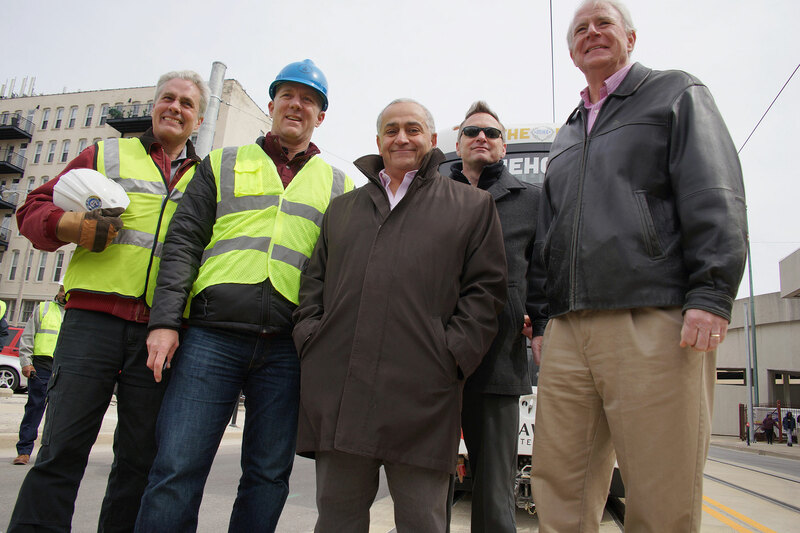 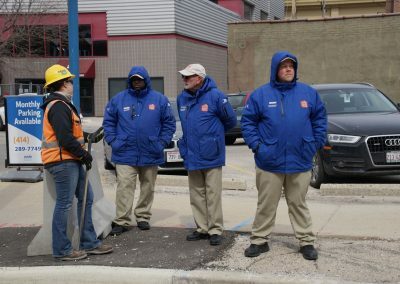 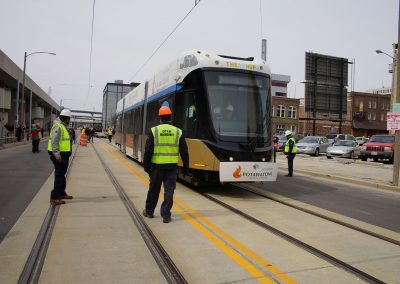 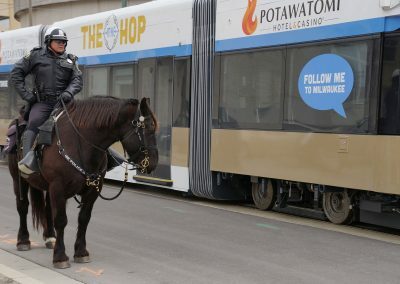 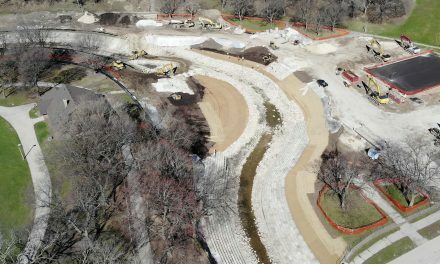 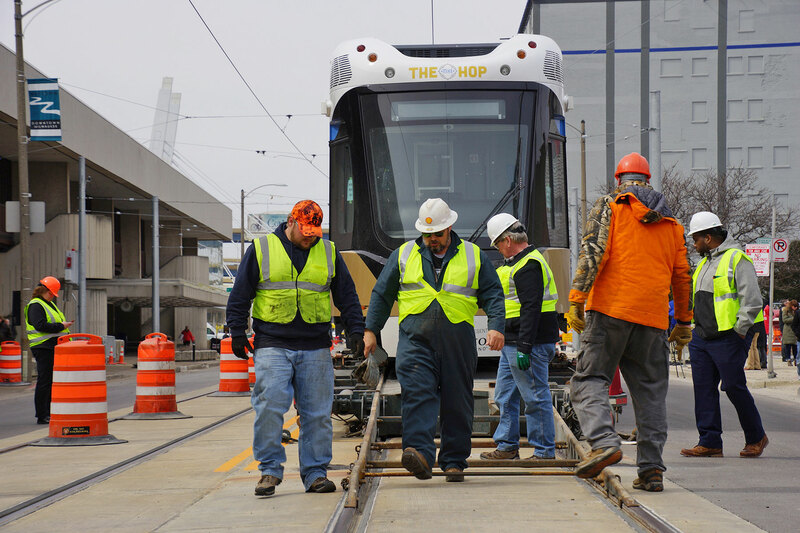 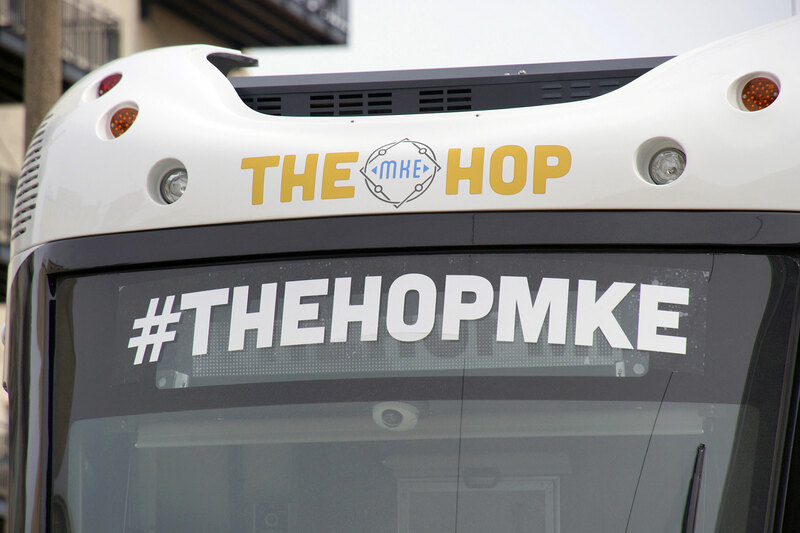 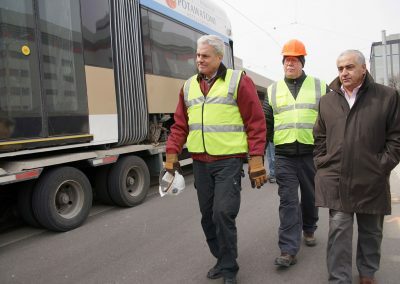 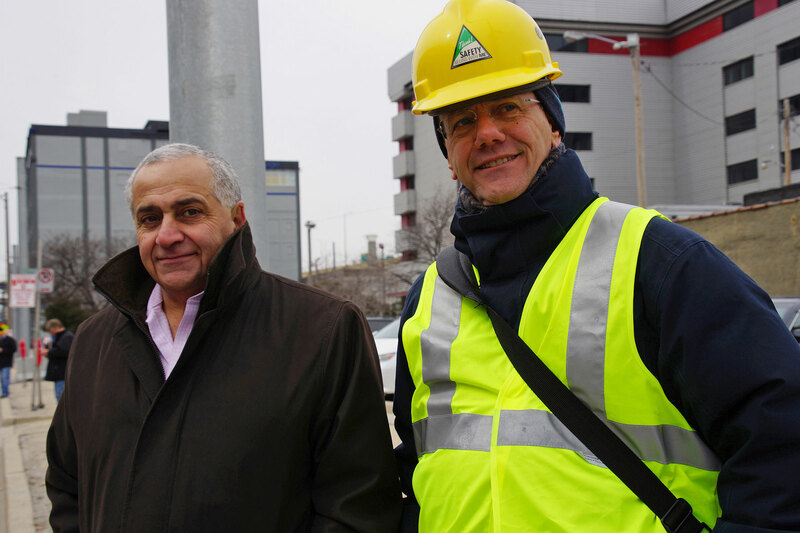 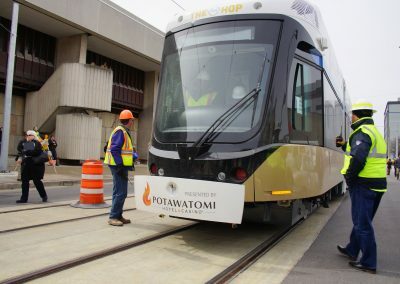 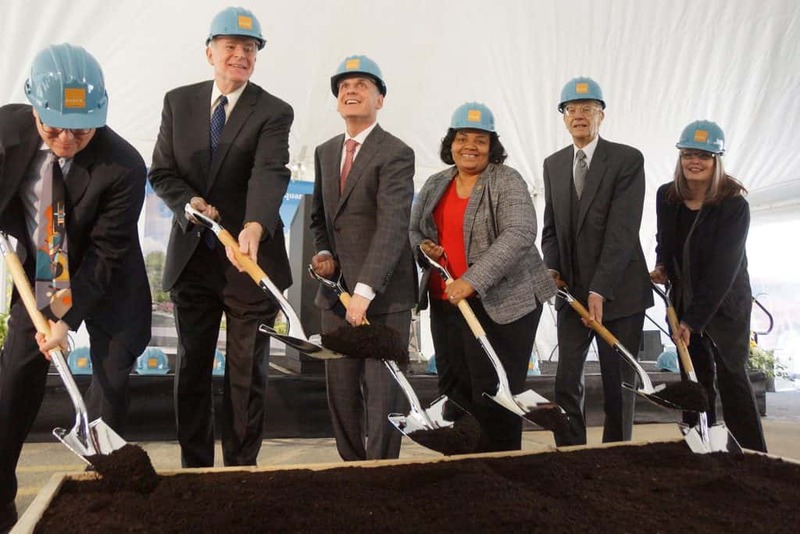 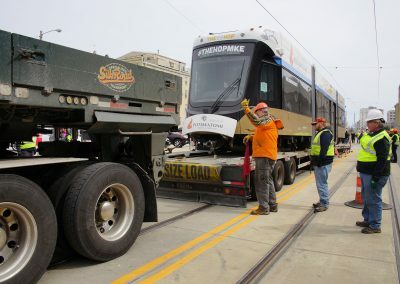 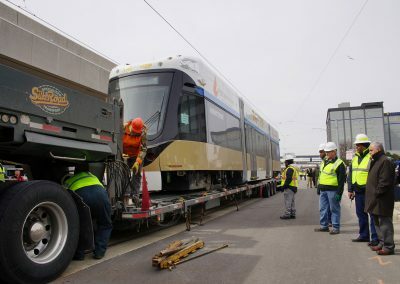 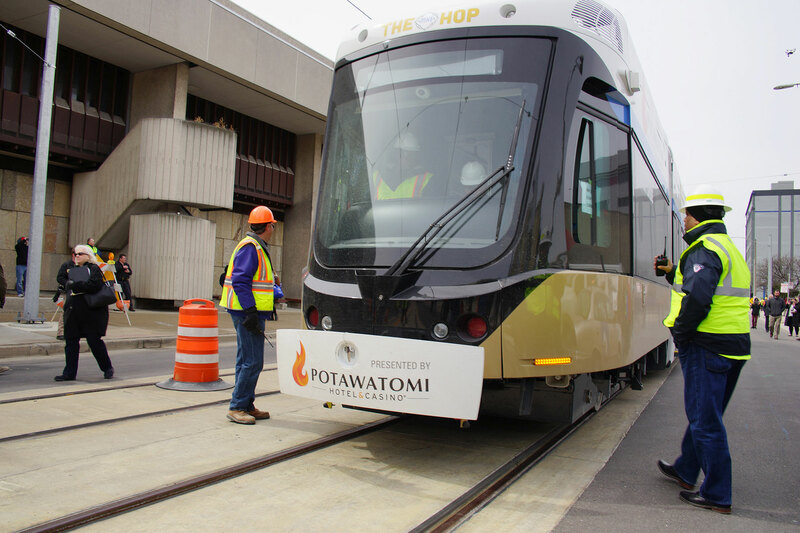 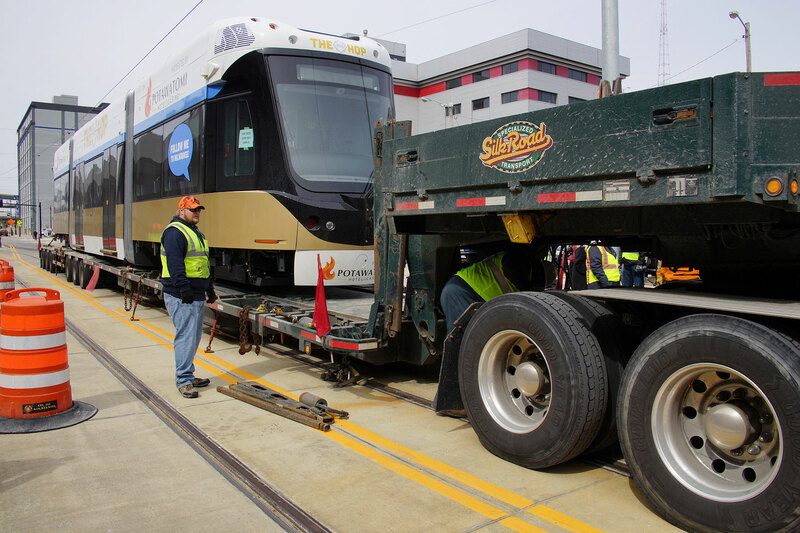 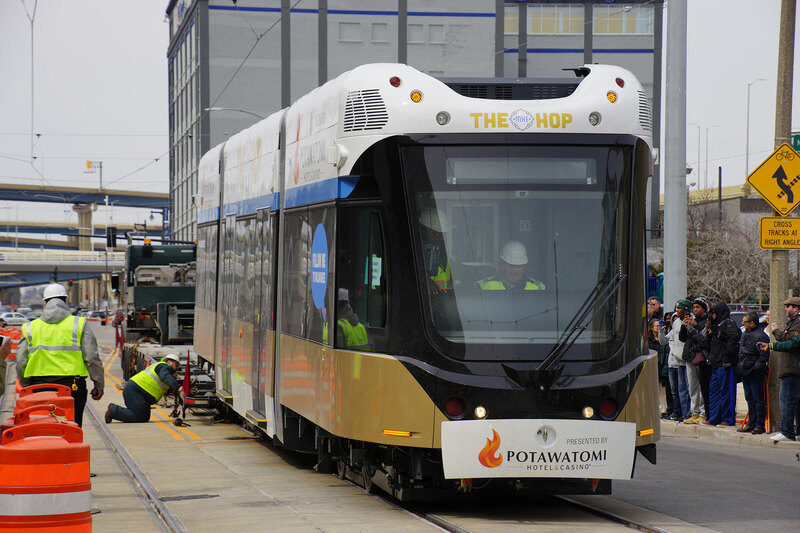 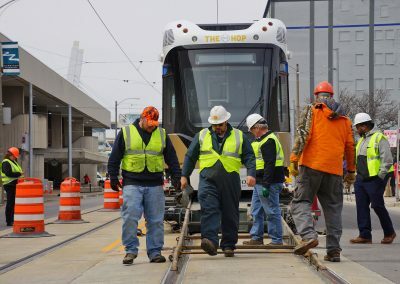 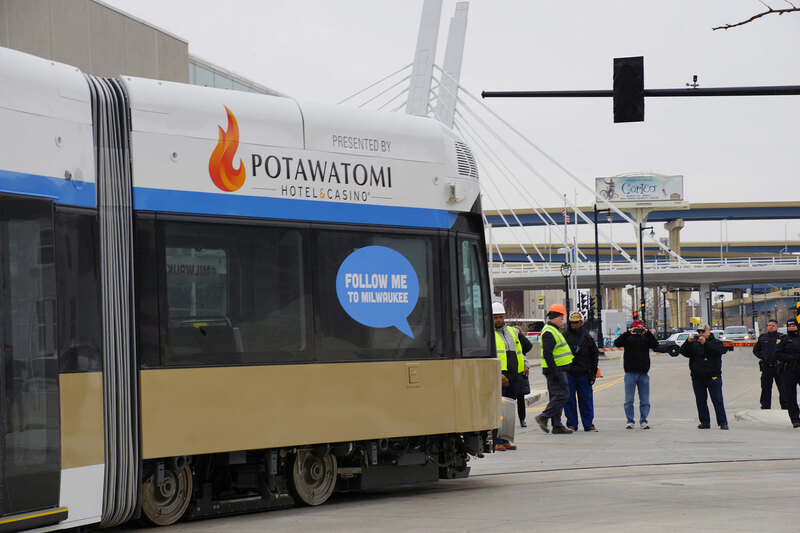 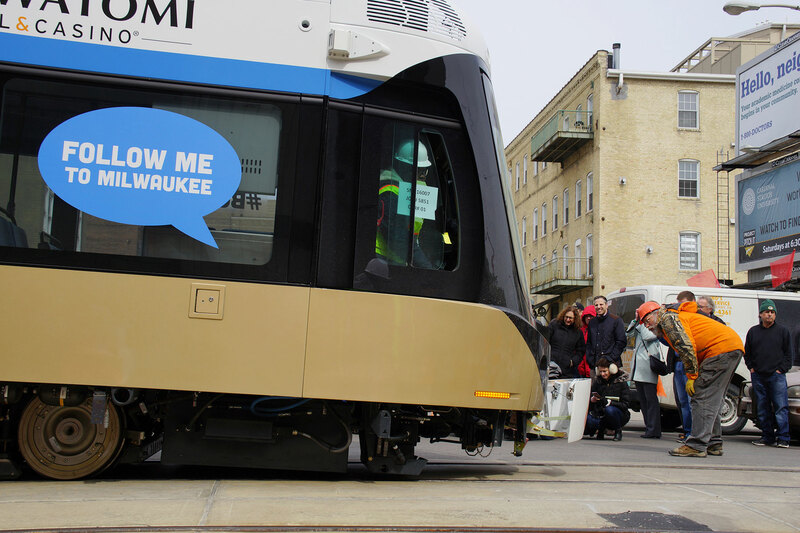 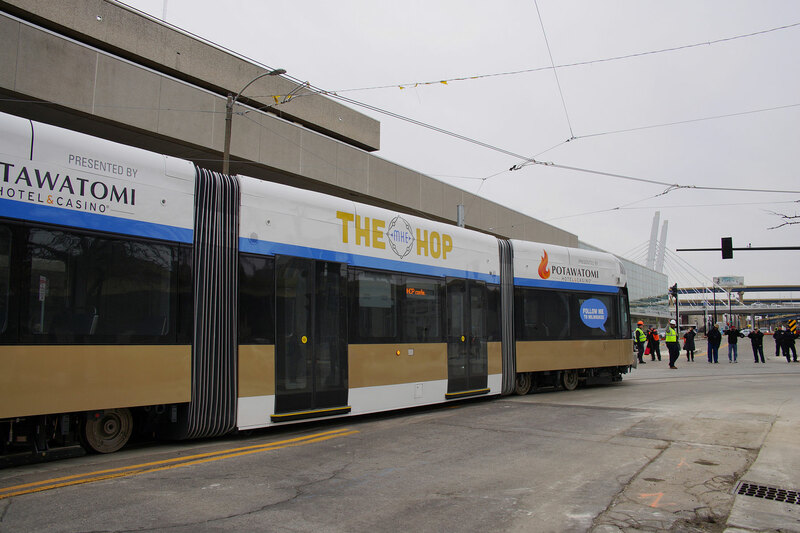 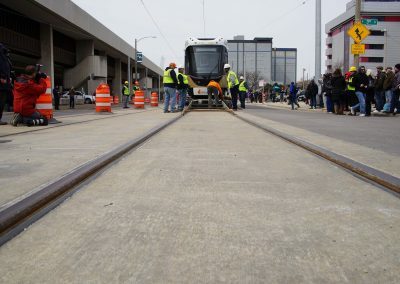 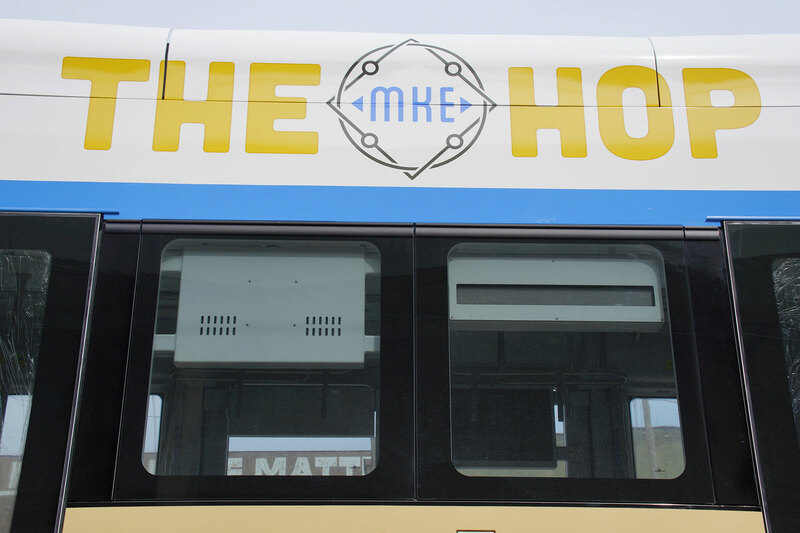 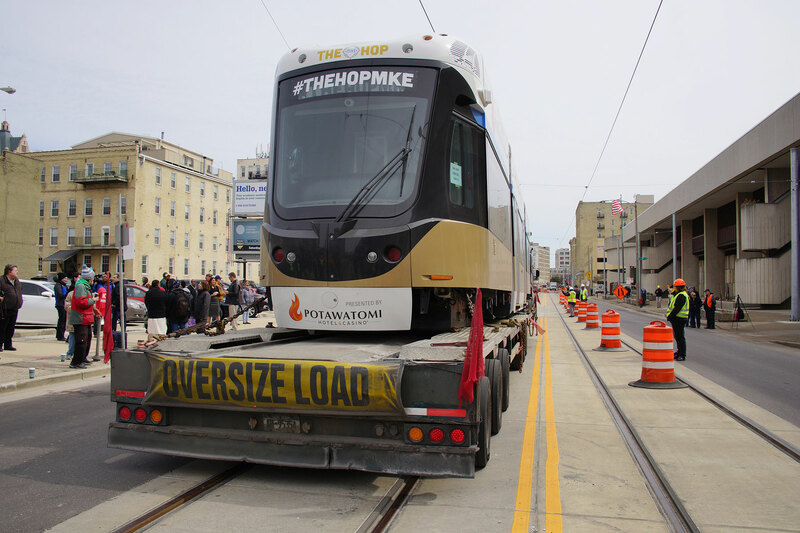 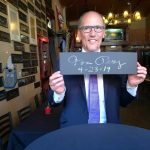 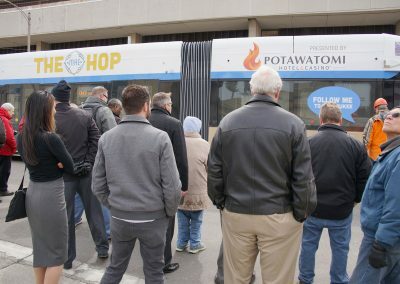 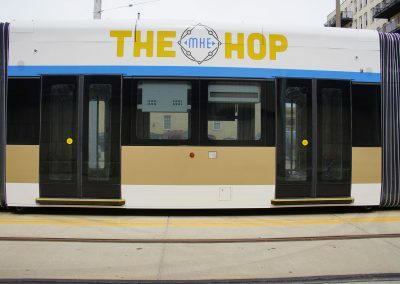 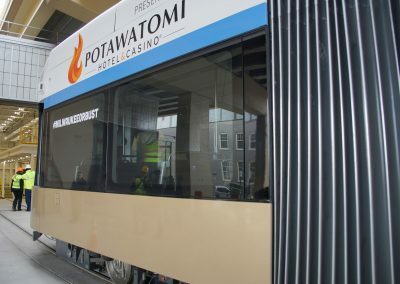 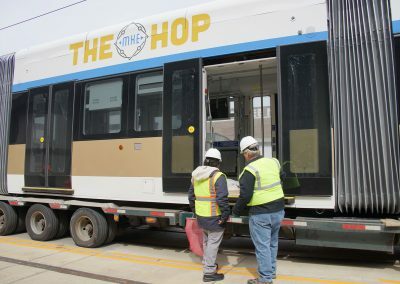 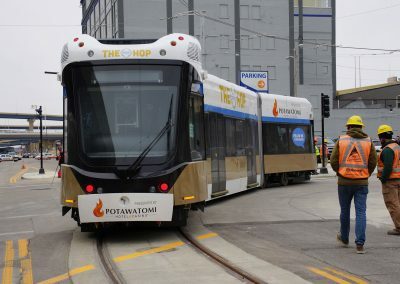 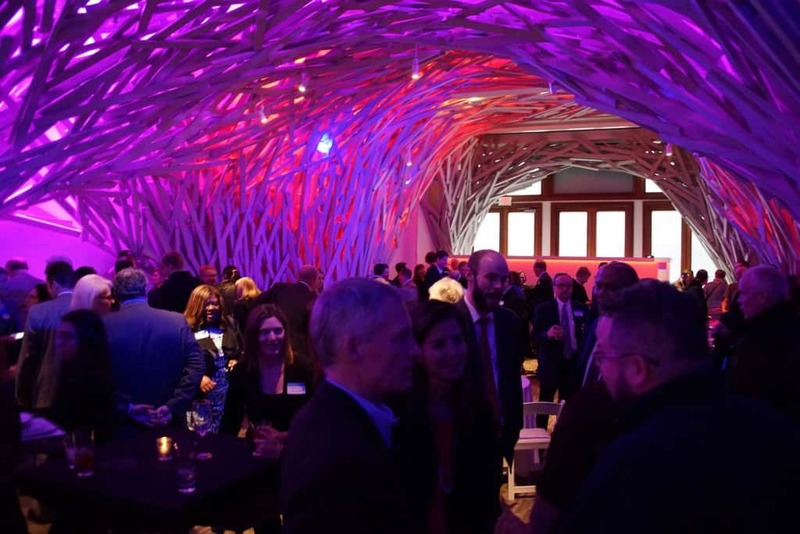 The first of five vehicles for the $128 million streetcar system was delivered to Milwaukee on March 26, welcomed by a jubilant crowd of dozens of area residents. 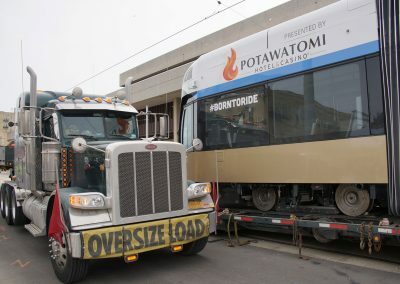 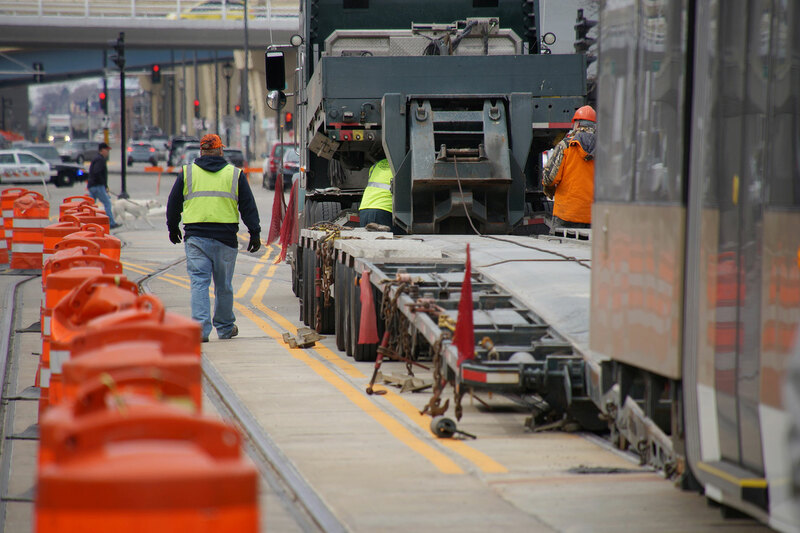 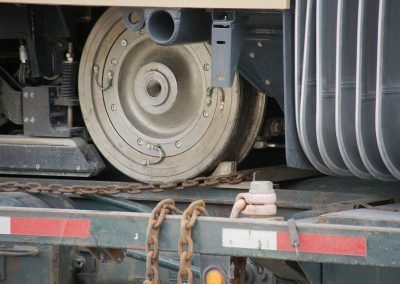 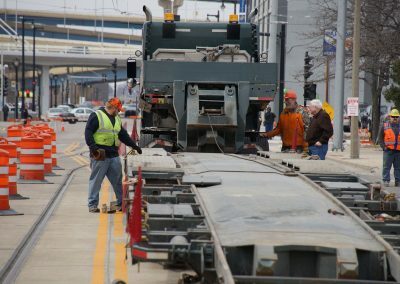 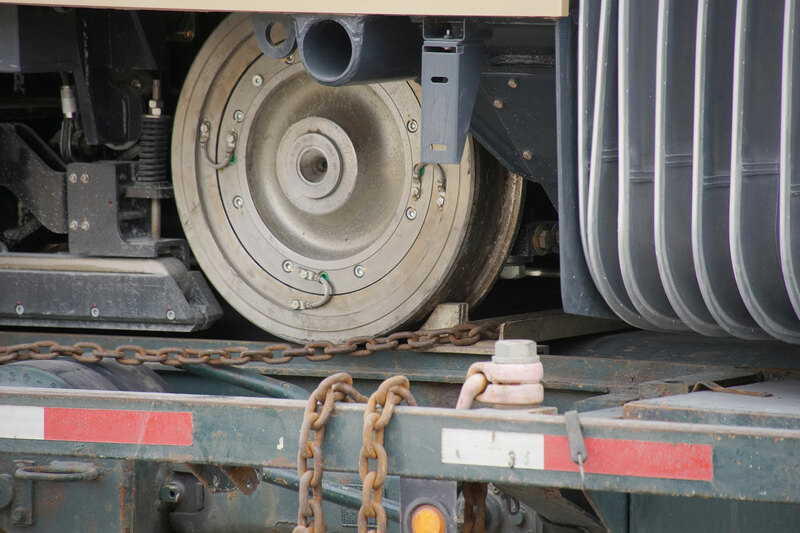 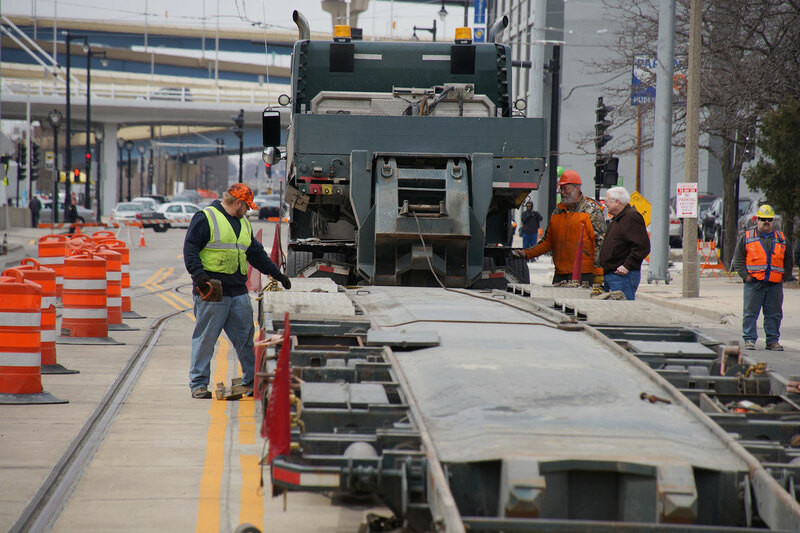 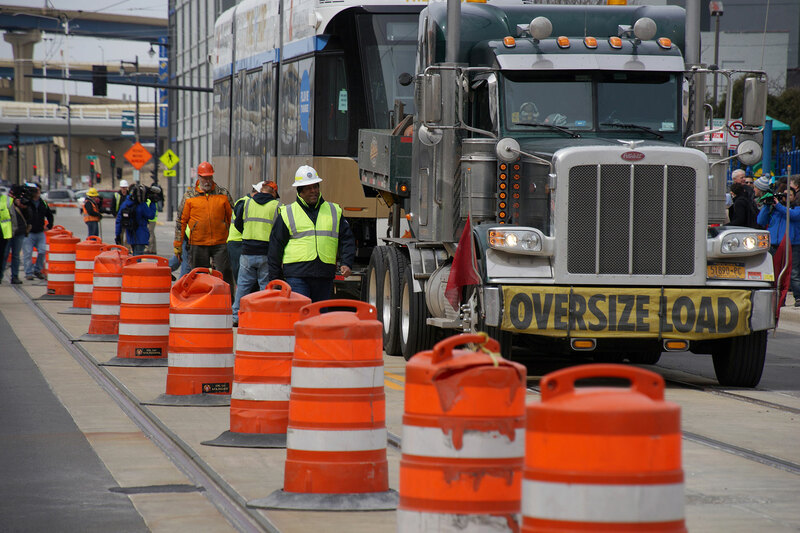 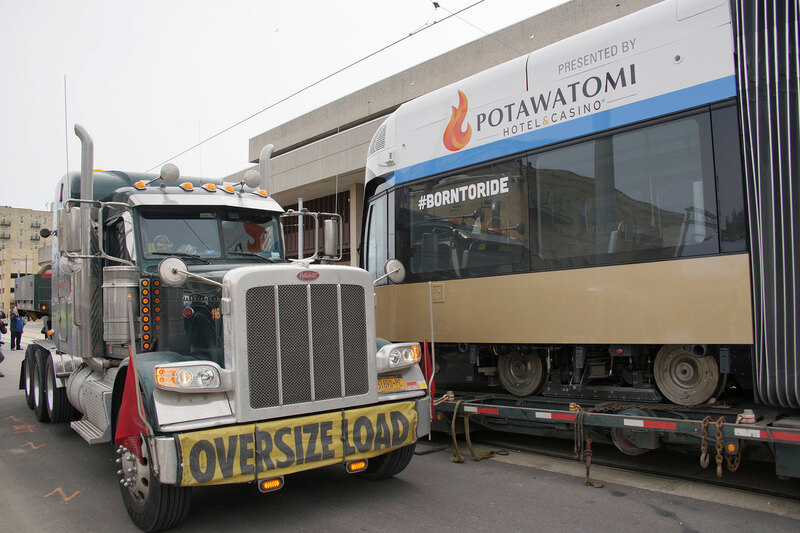 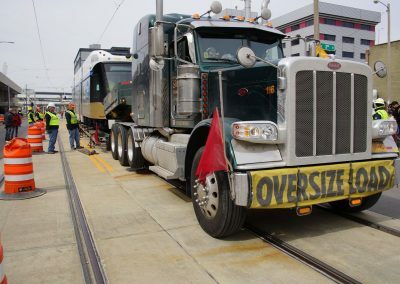 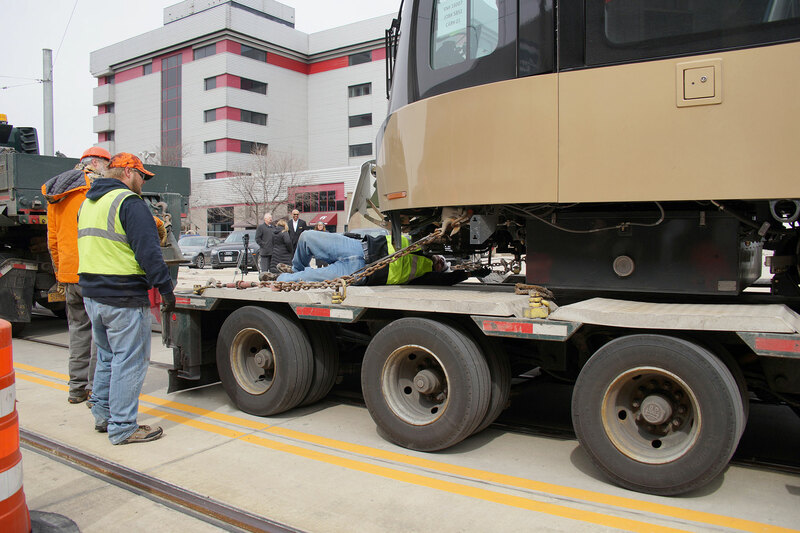 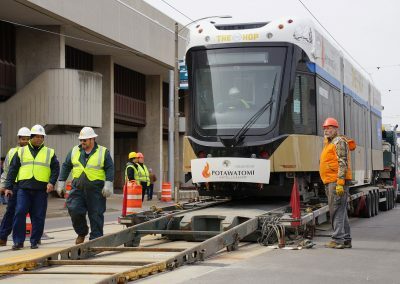 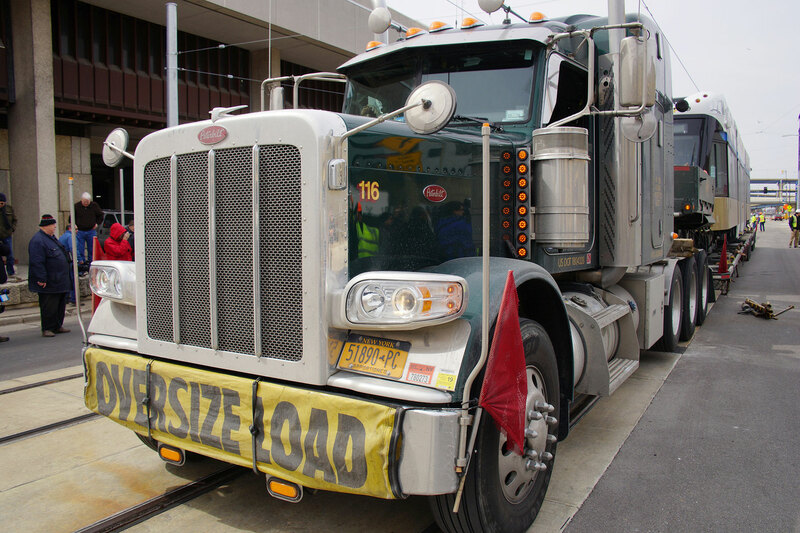 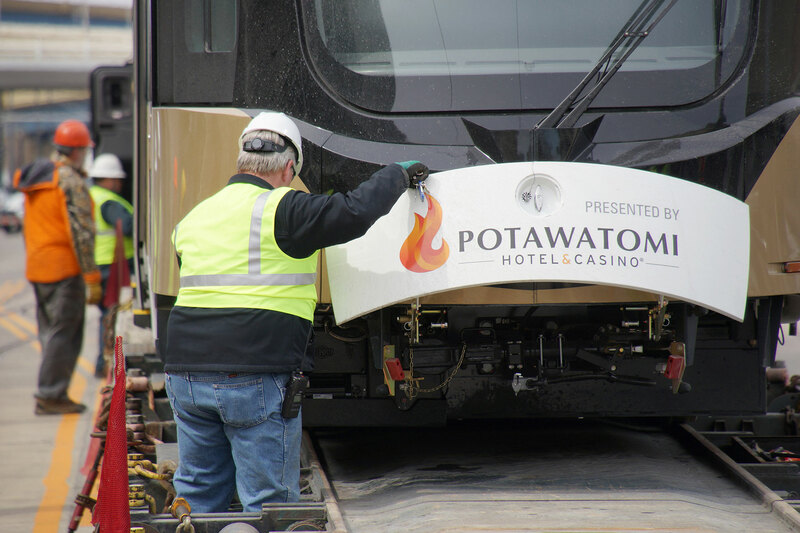 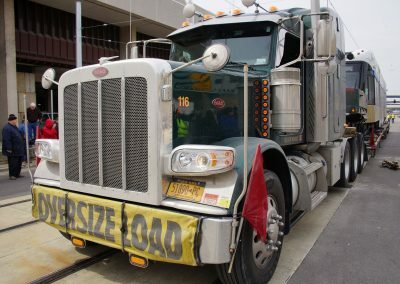 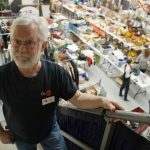 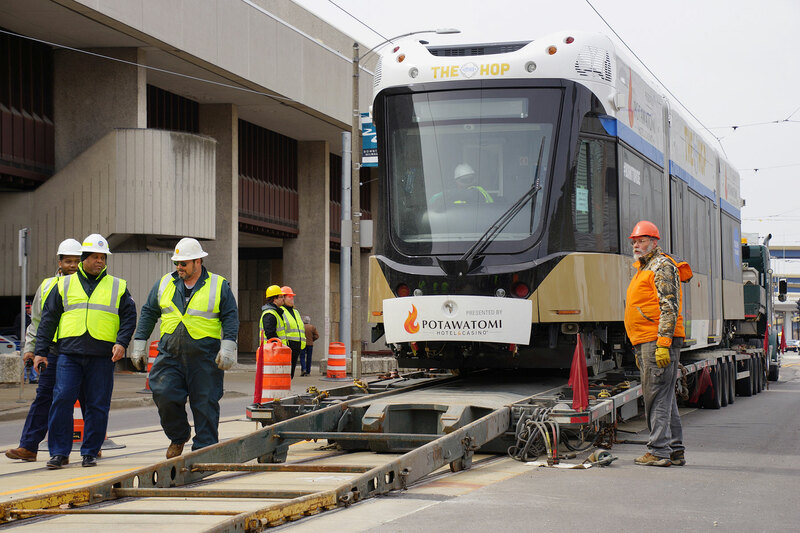 The 67-foot long, 83,000-pound streetcar traveled almost four days from its Brookville Equipment Corp. manufacturing plant in Pennsylvania by a special flatbed truck, and was unloaded onto a stretch of rails along W. St. Paul Avenue between 3rd and 4th Streets. 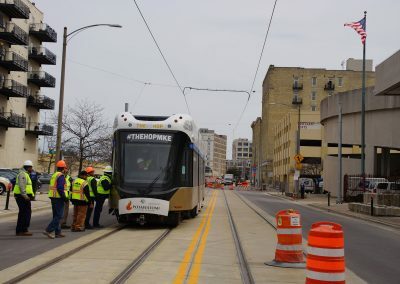 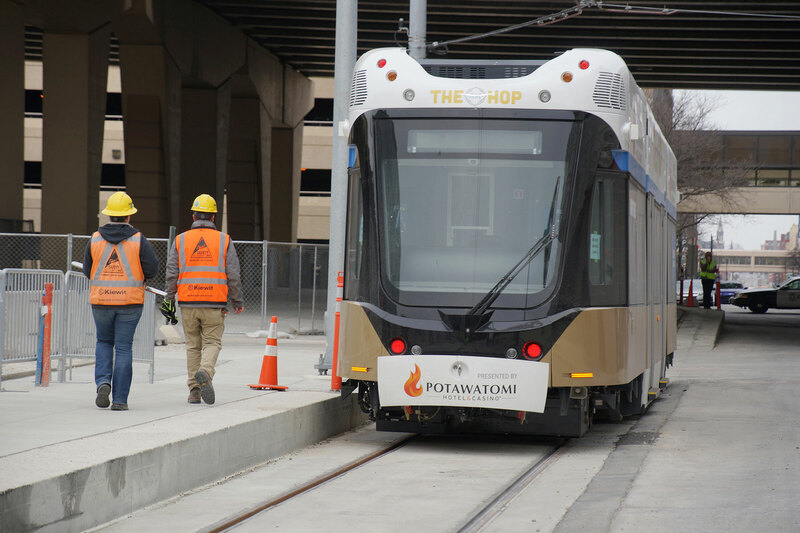 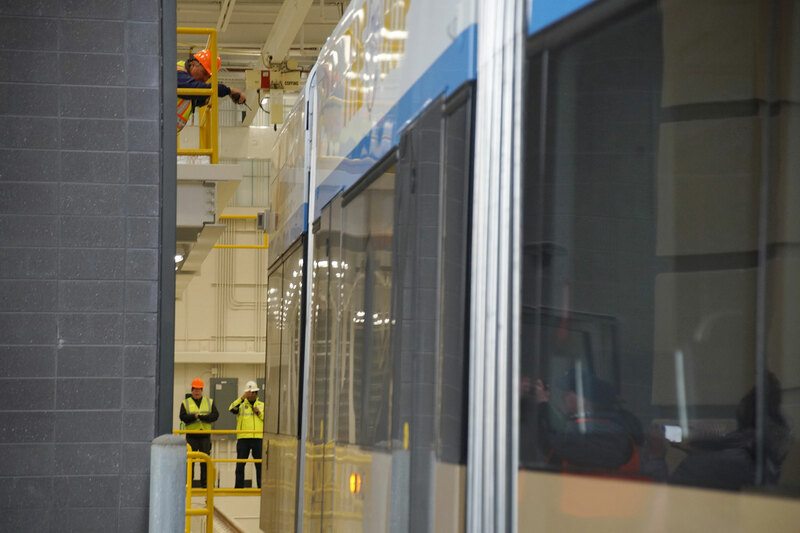 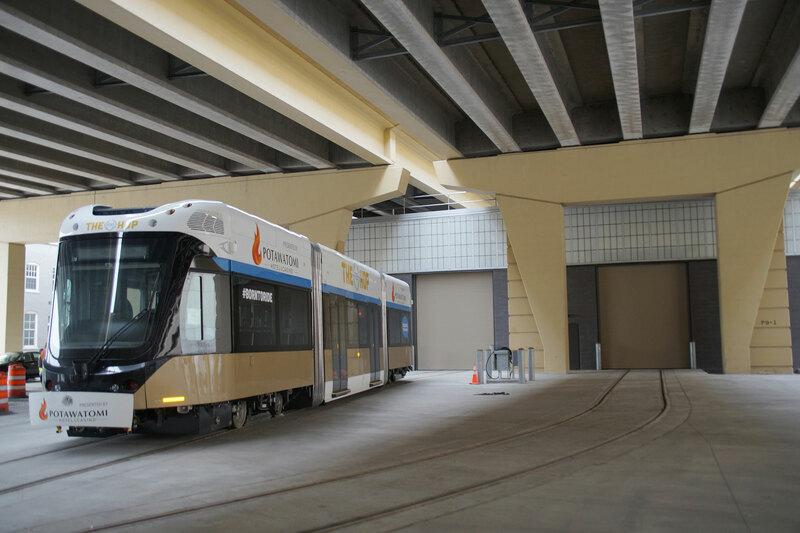 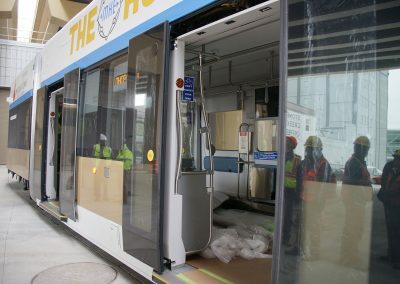 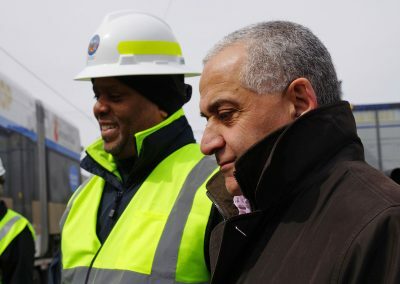 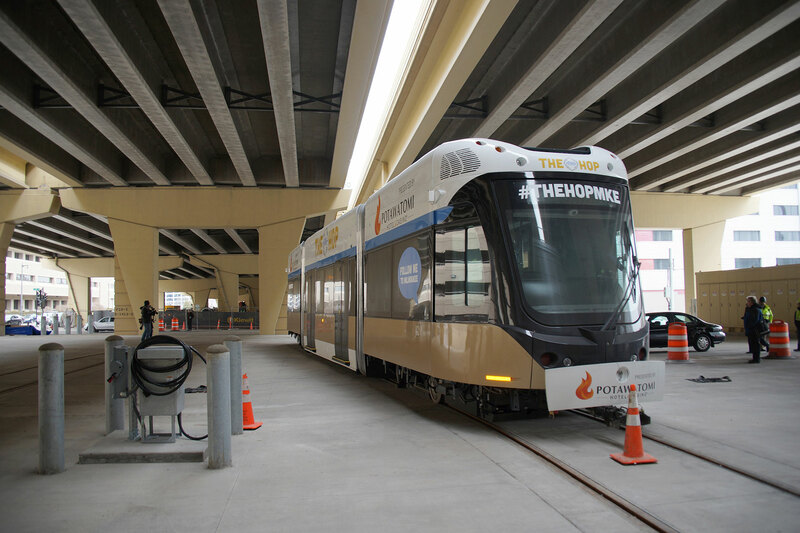 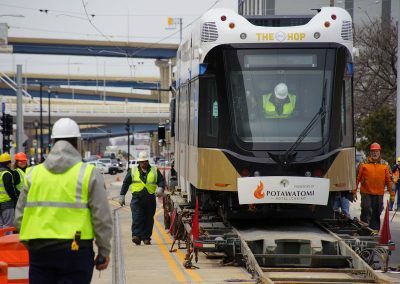 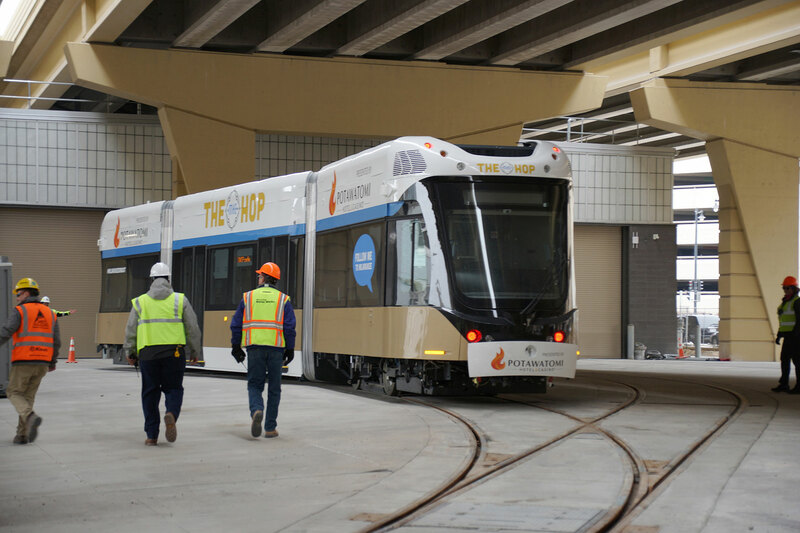 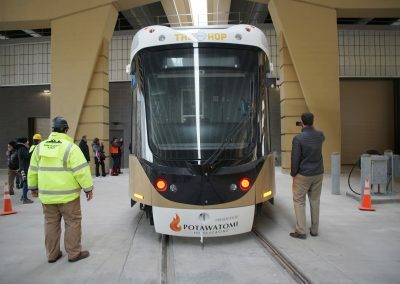 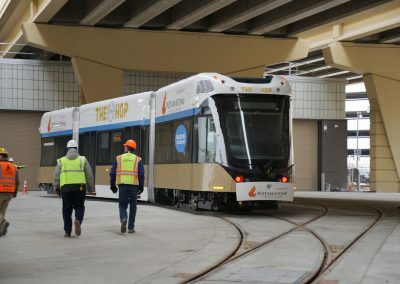 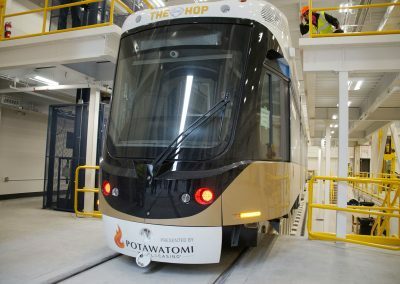 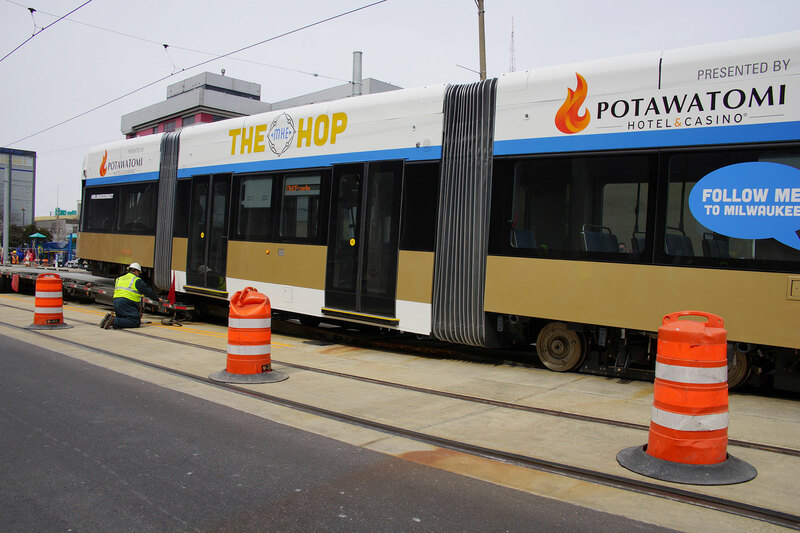 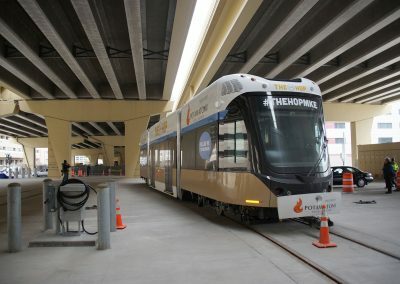 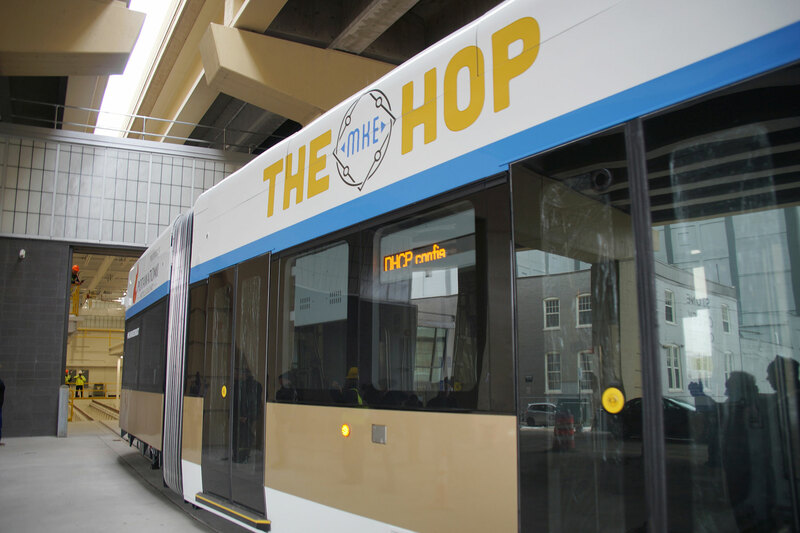 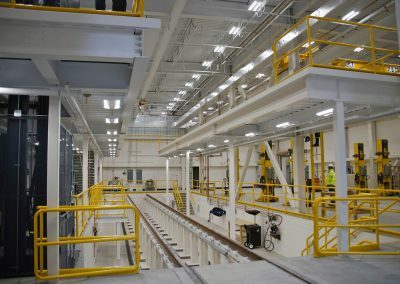 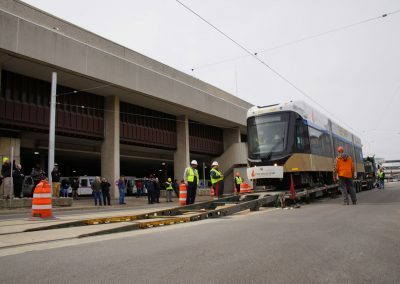 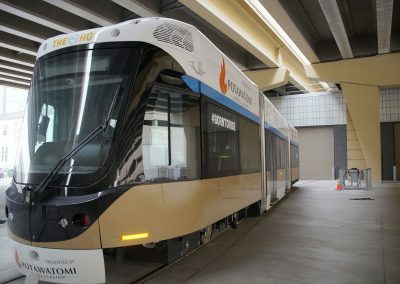 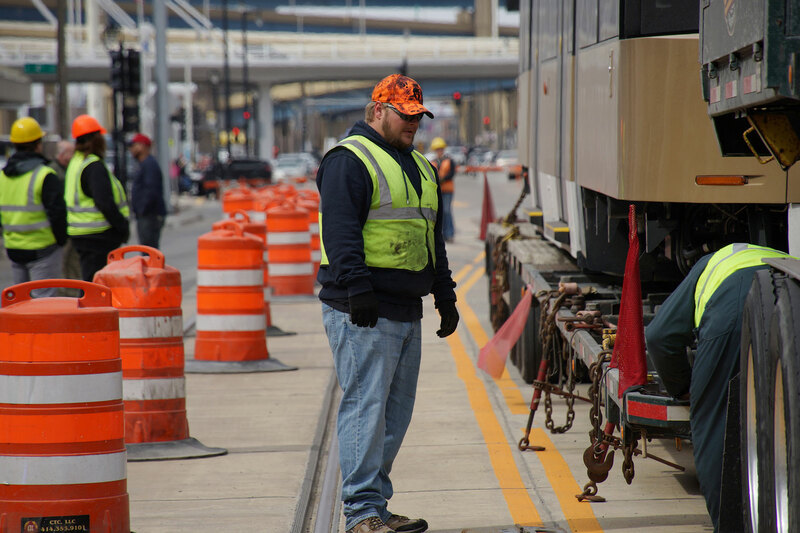 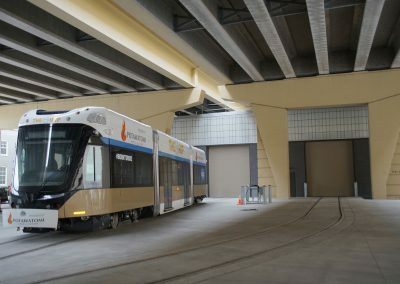 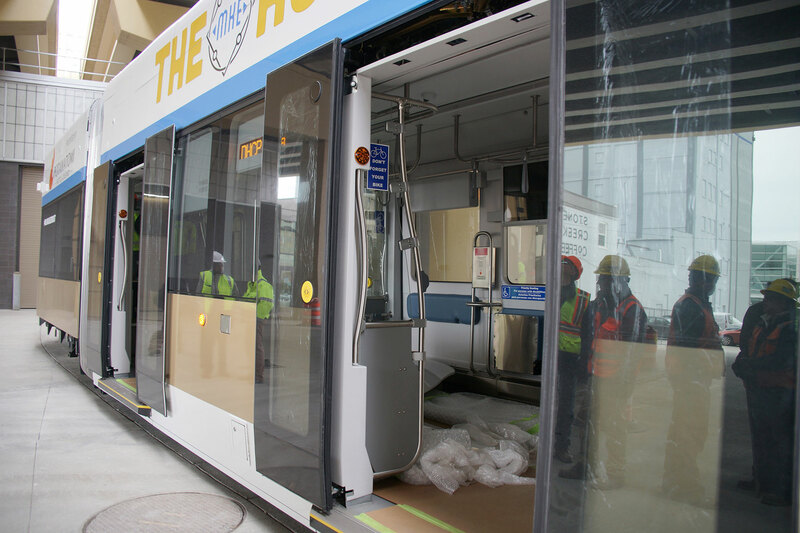 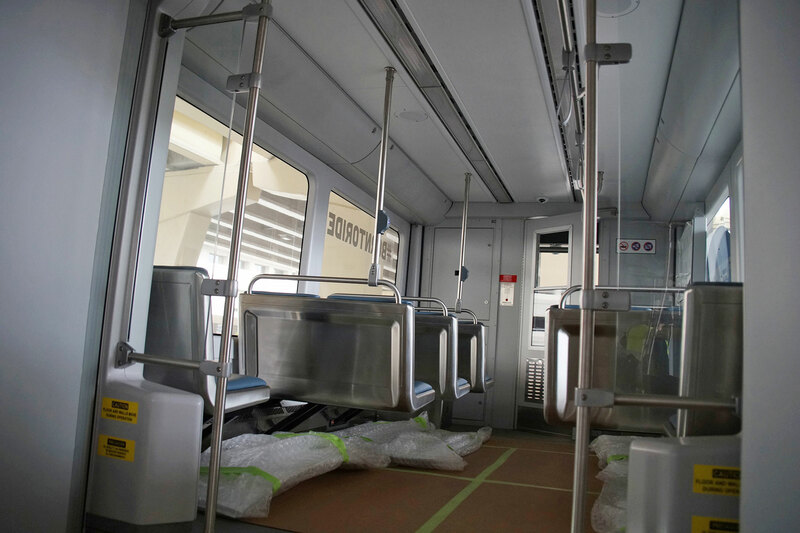 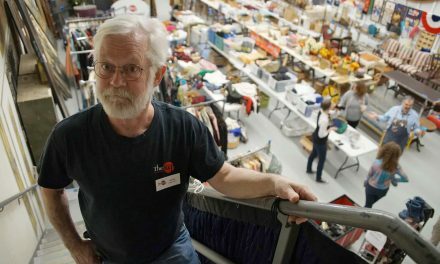 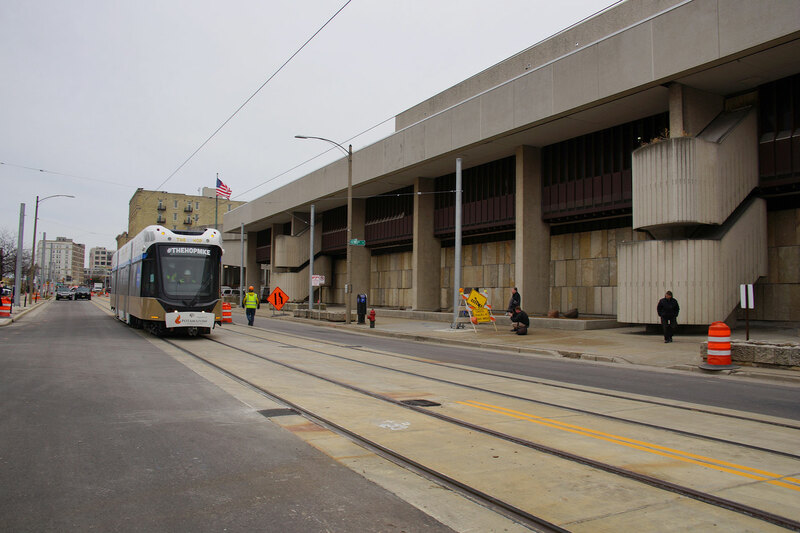 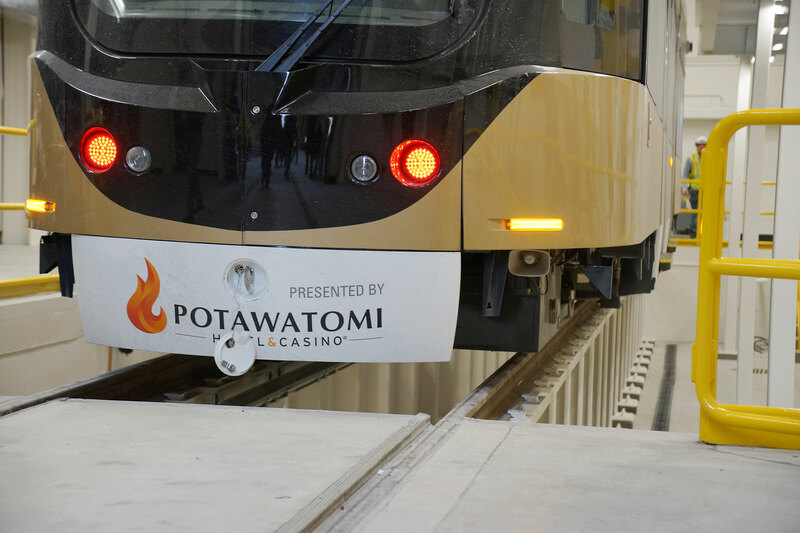 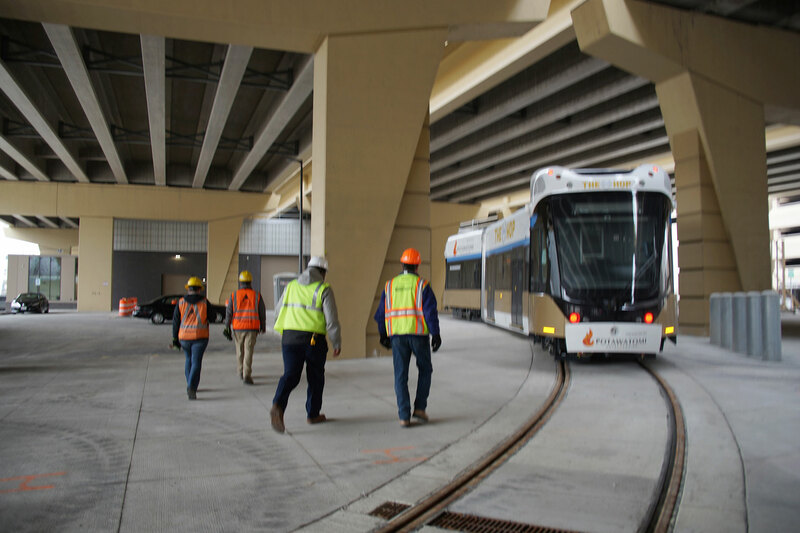 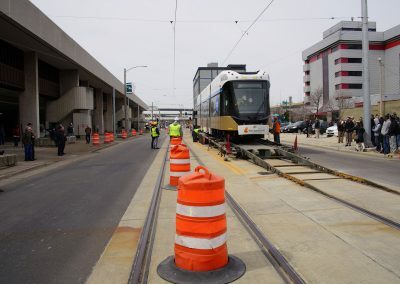 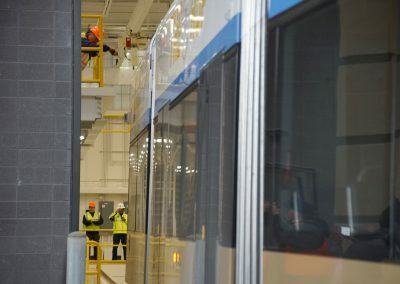 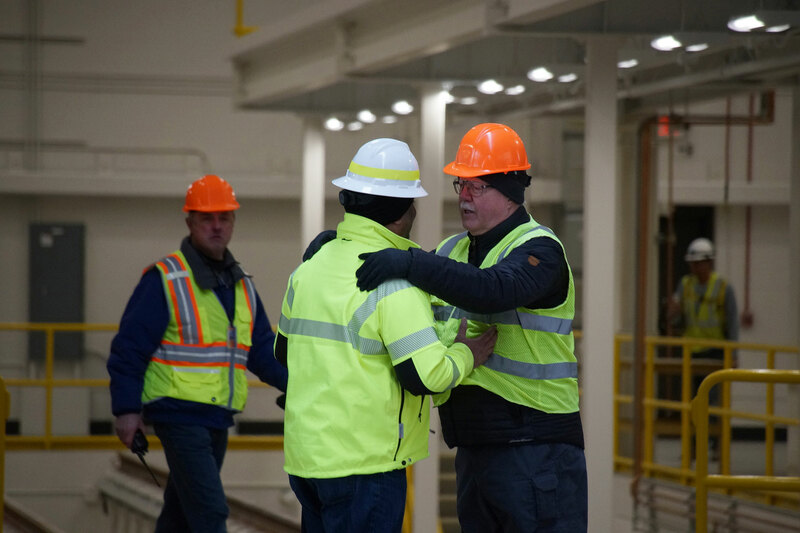 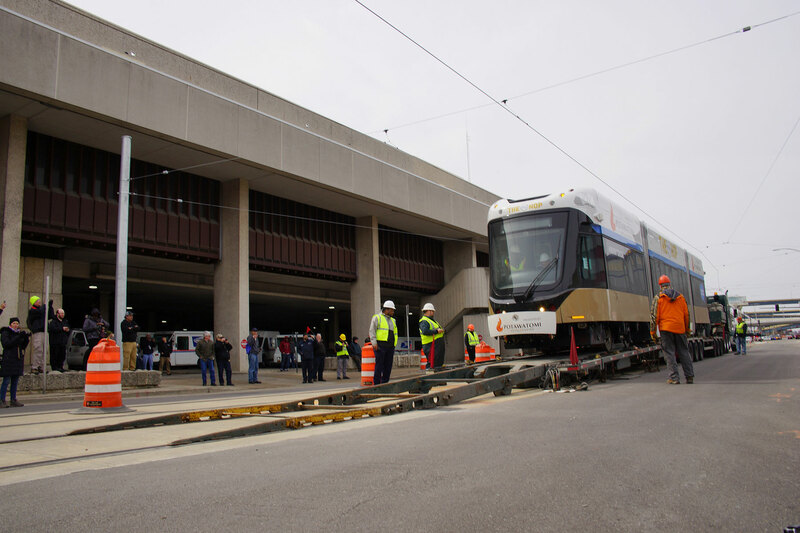 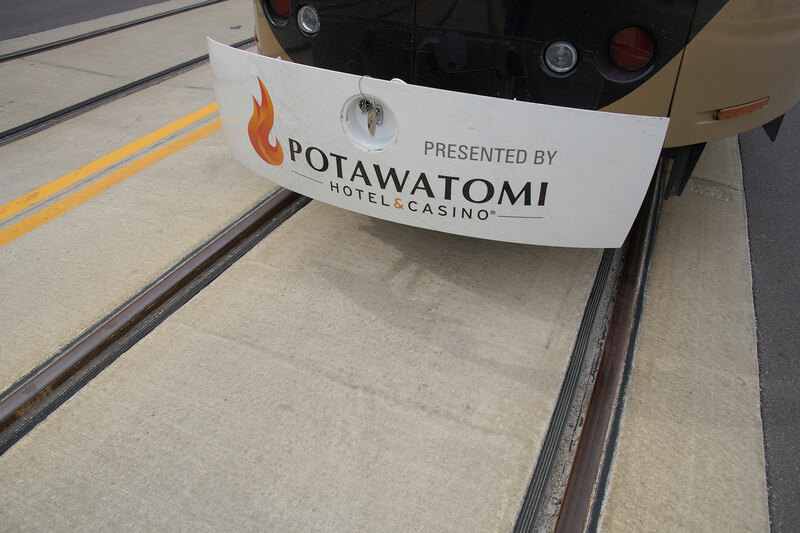 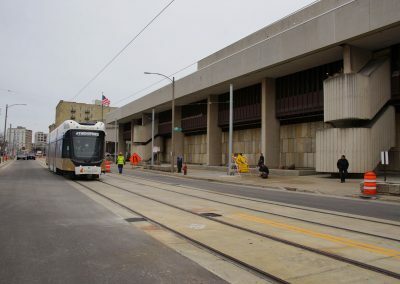 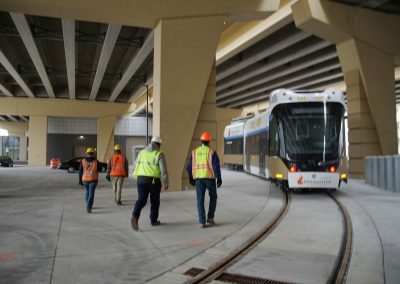 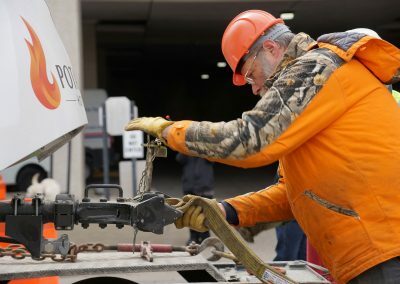 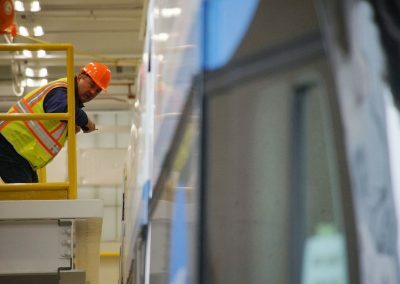 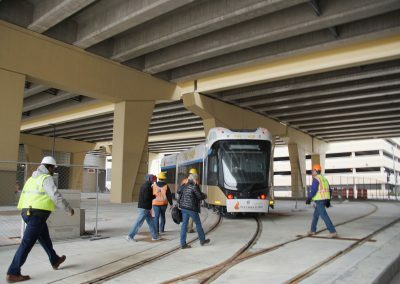 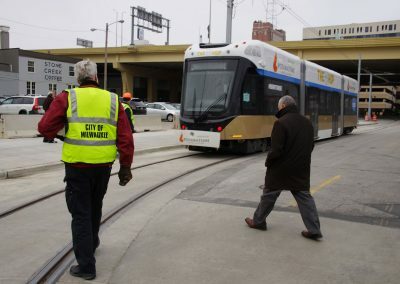 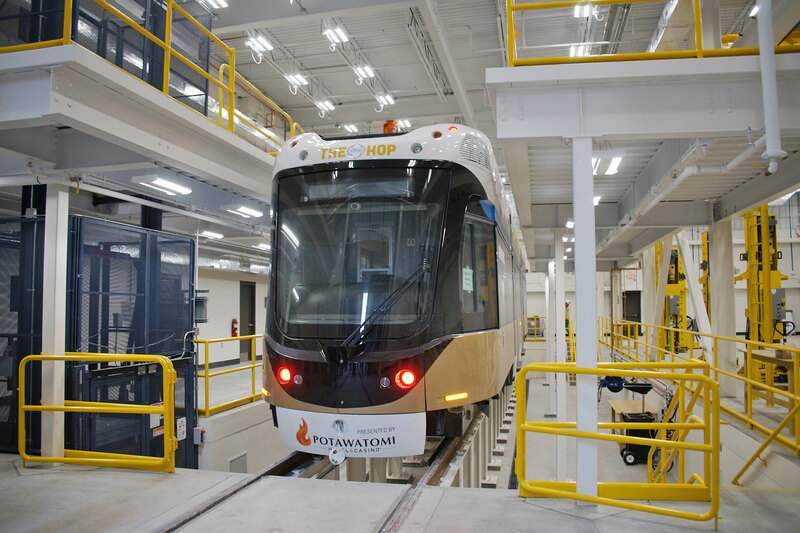 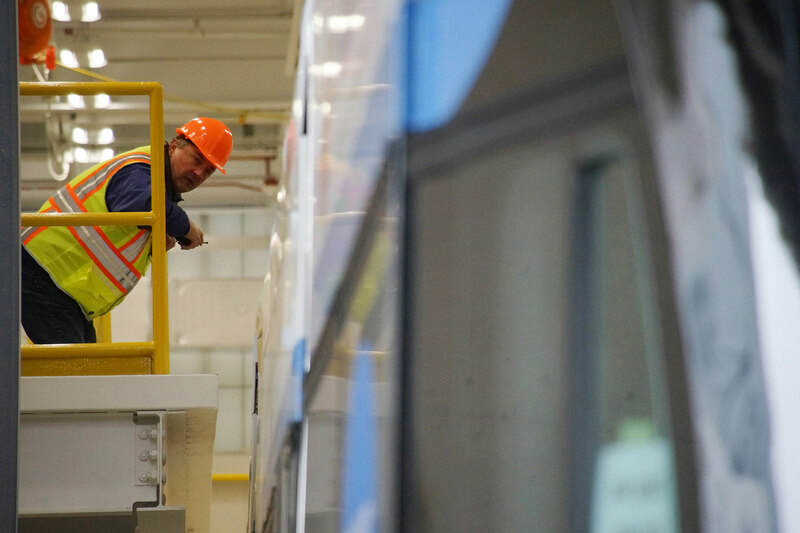 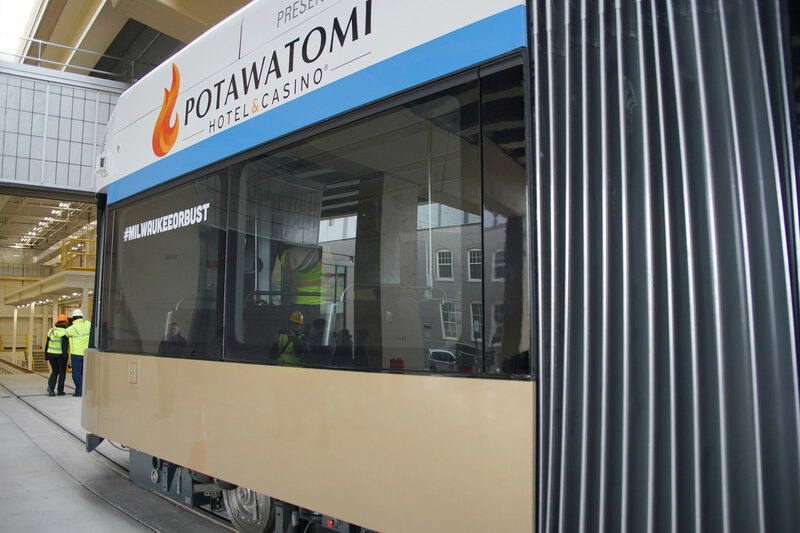 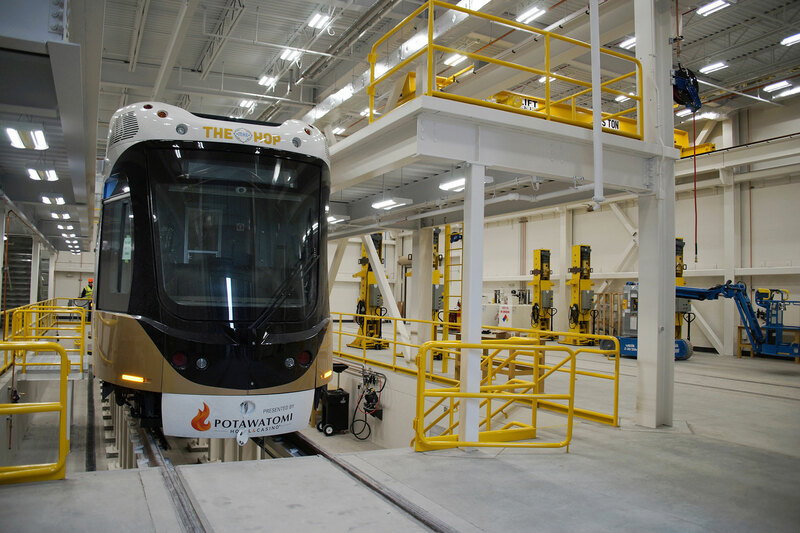 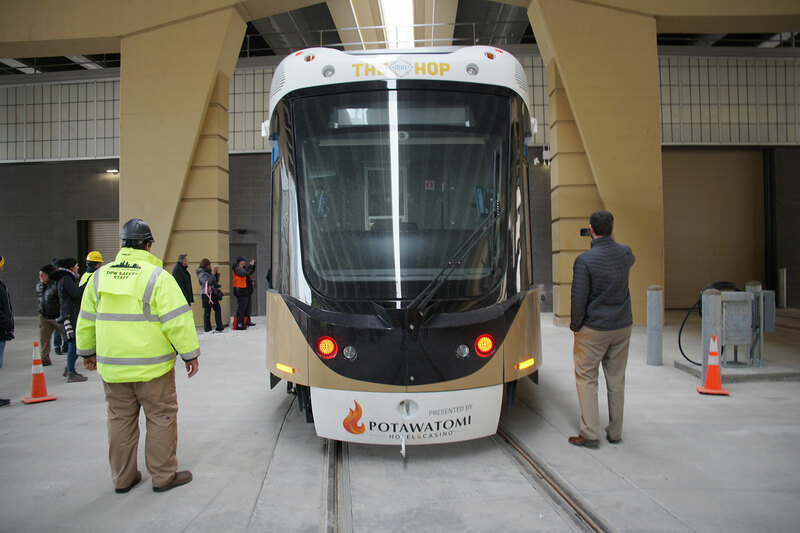 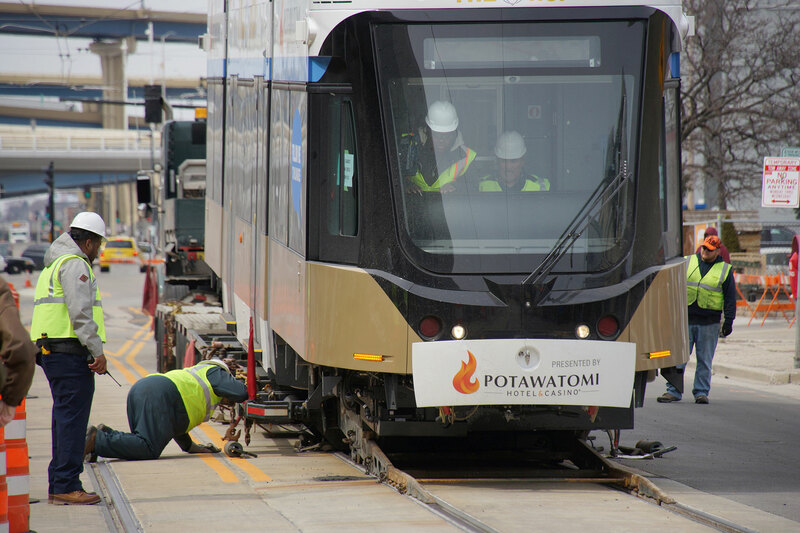 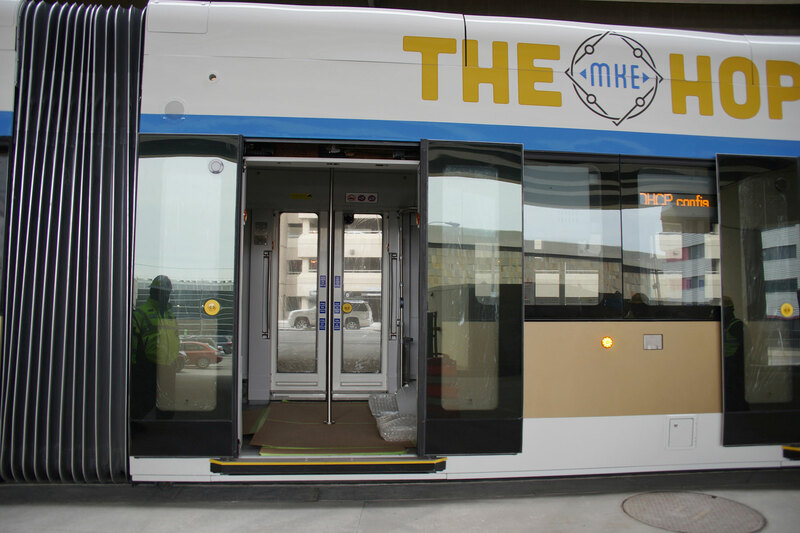 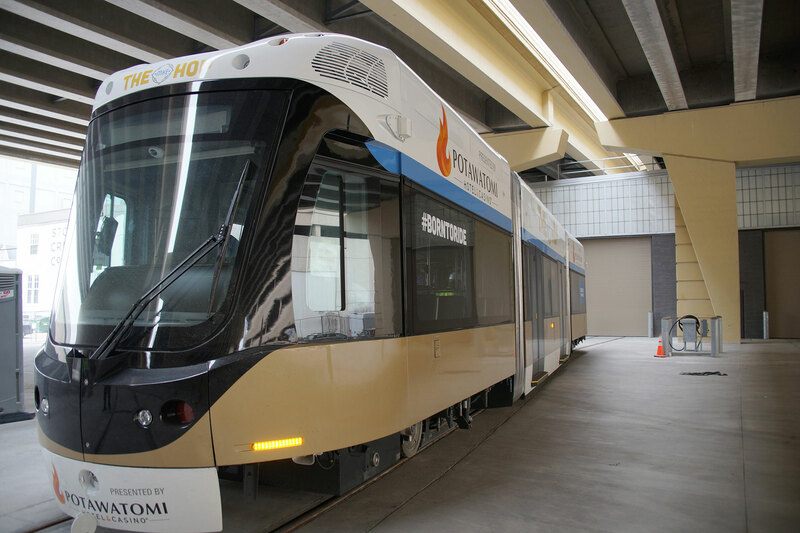 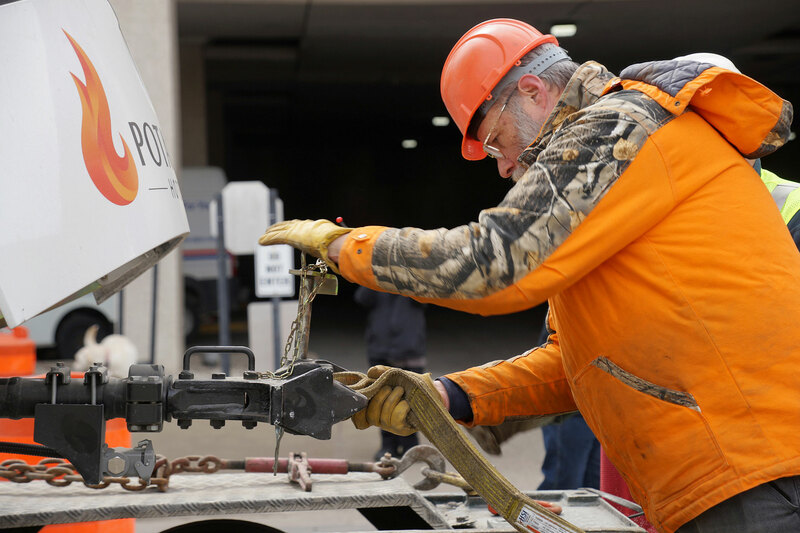 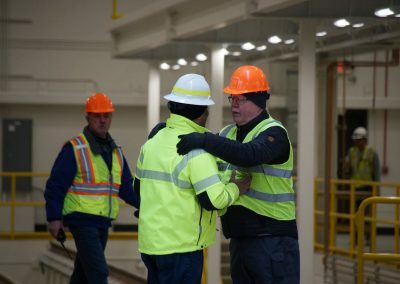 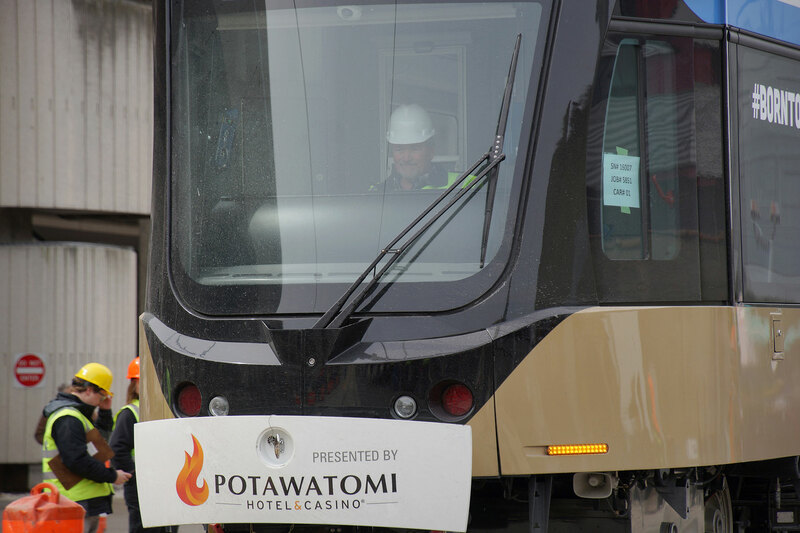 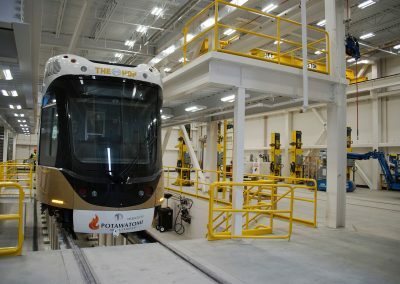 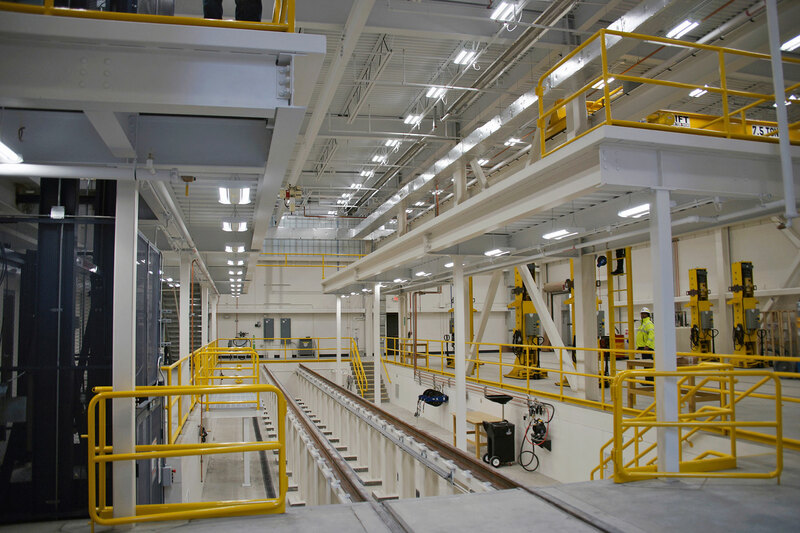 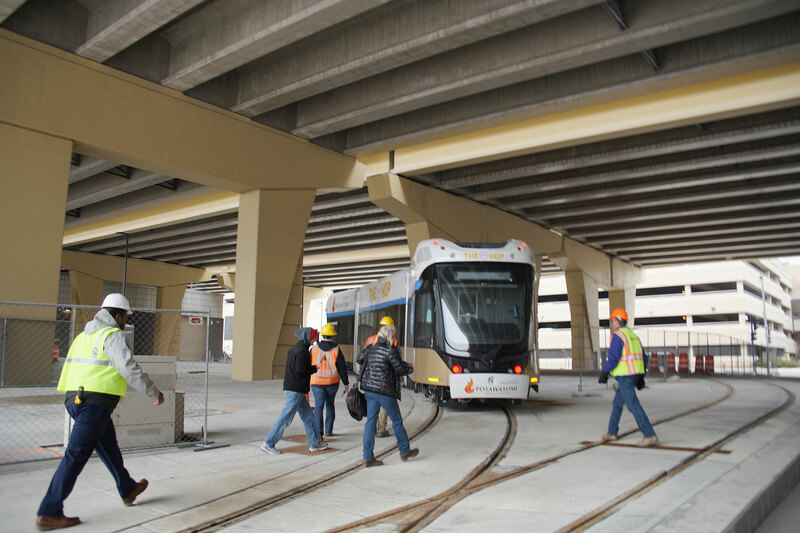 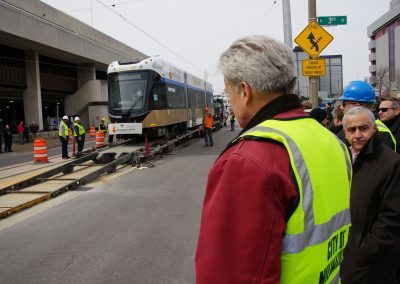 Operating from a limited battery charge, the streetcar was driven a few hundred yards into its new home, the Operations and Maintenance Facility recently built underneath the Interstate 794 overpass. 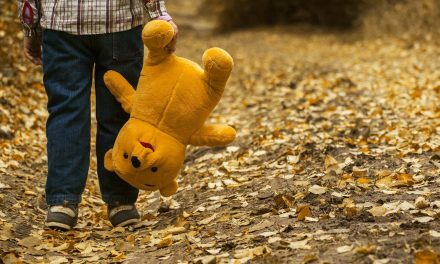 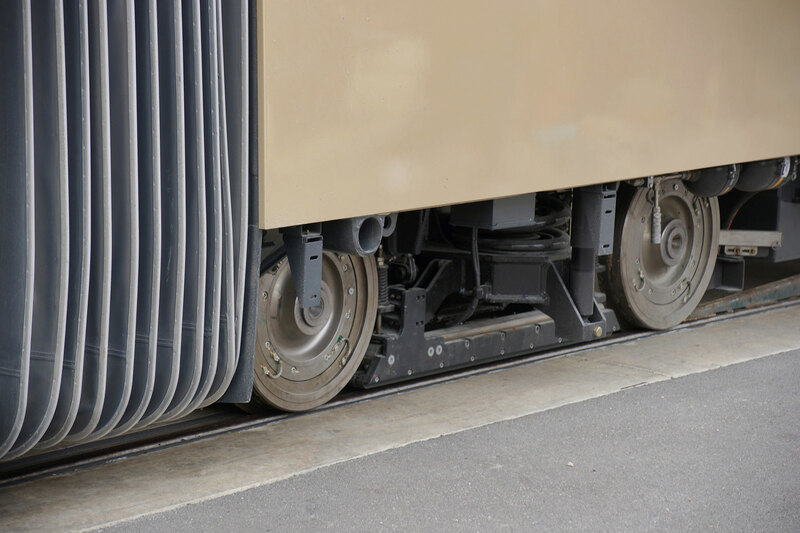 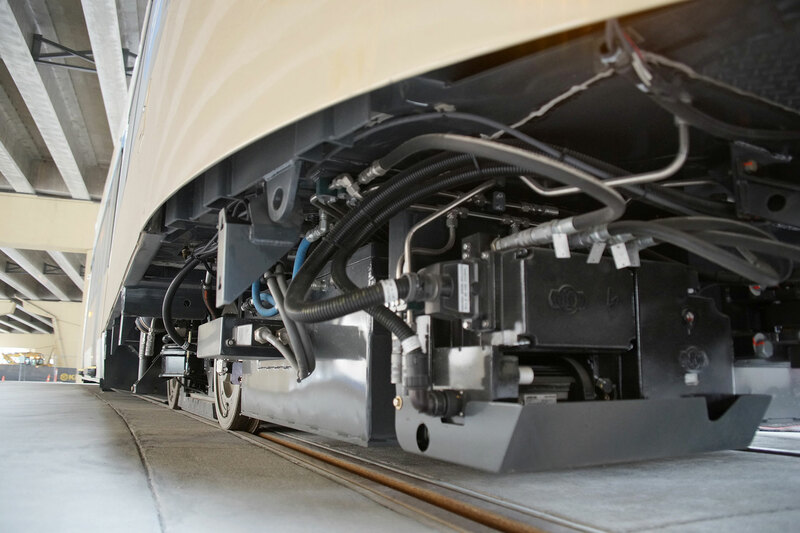 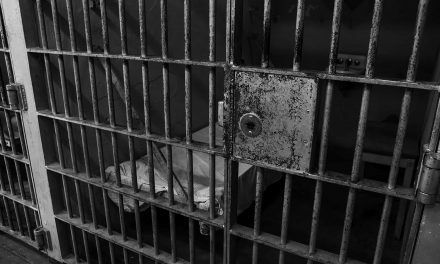 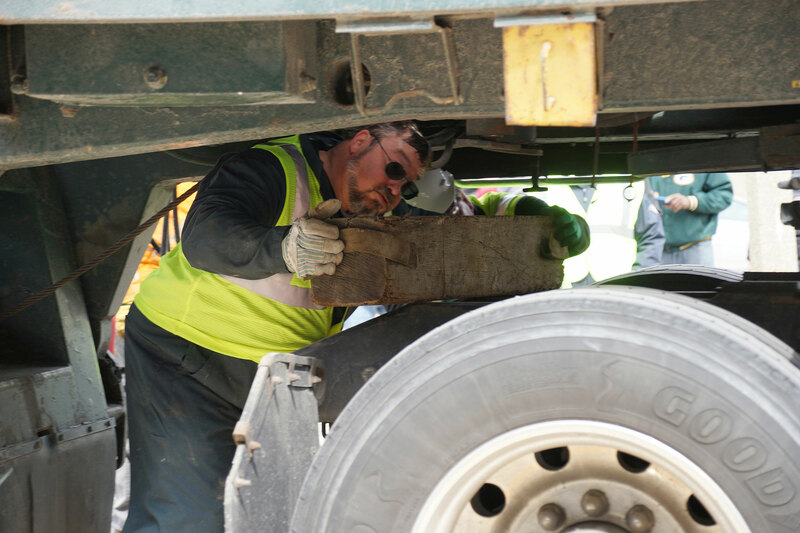 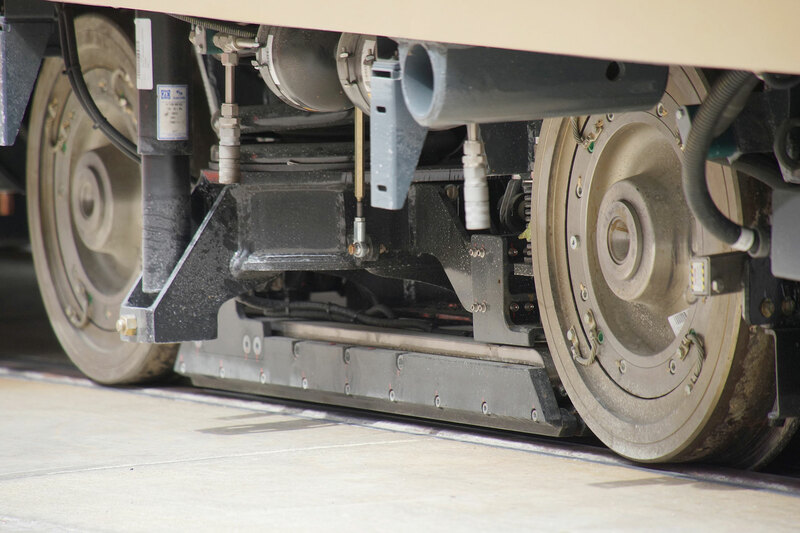 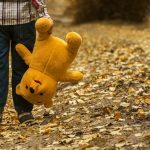 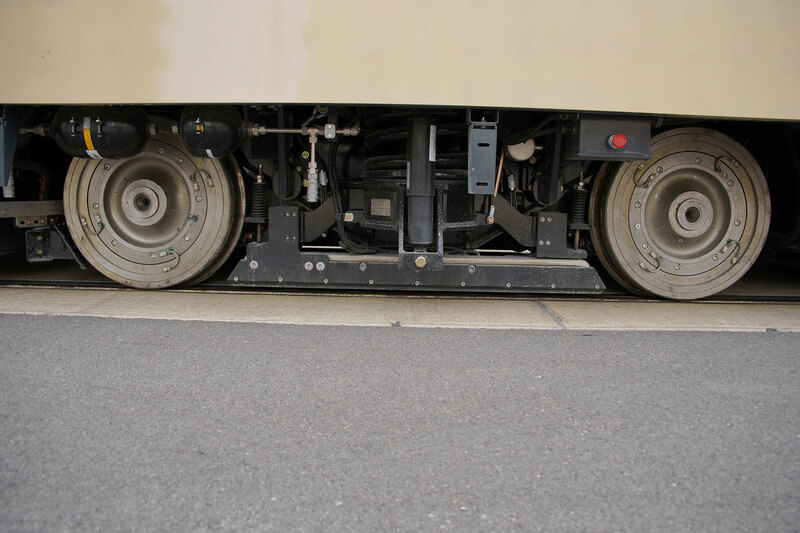 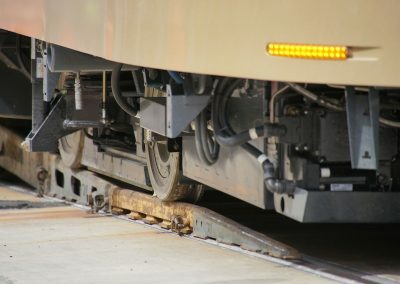 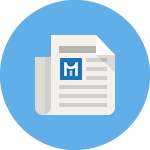 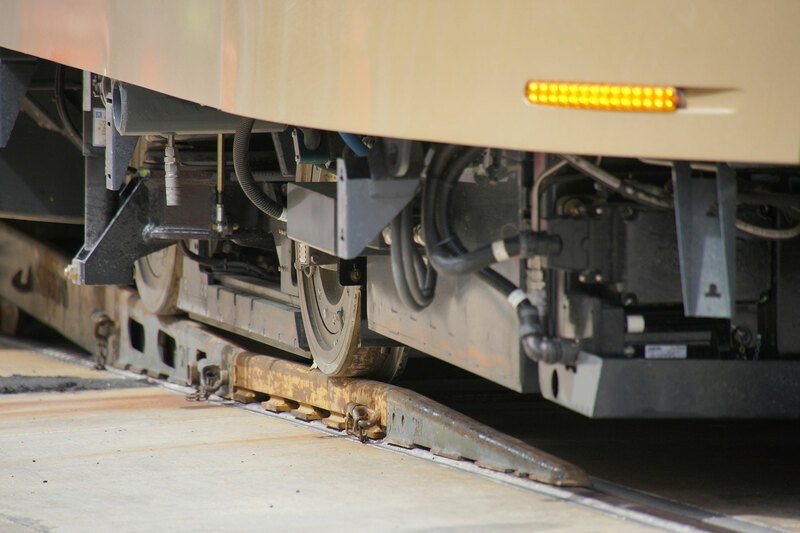 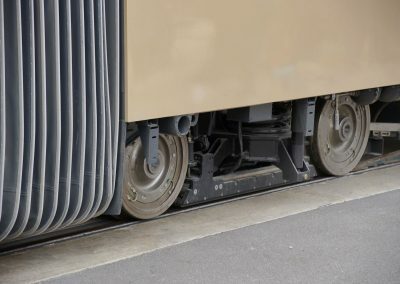 Missing from the vehicle was the roof system to convey electrical current from the overhead wires to power the engine, and a protective skirt that will cover the wheels. 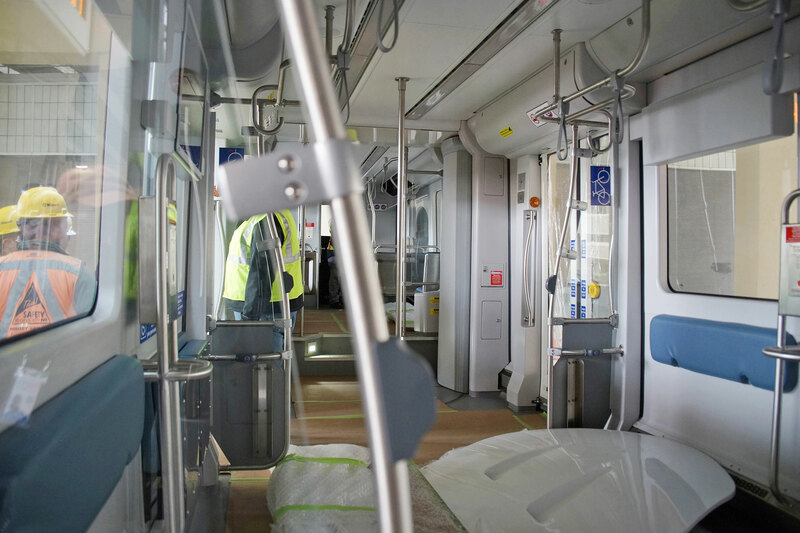 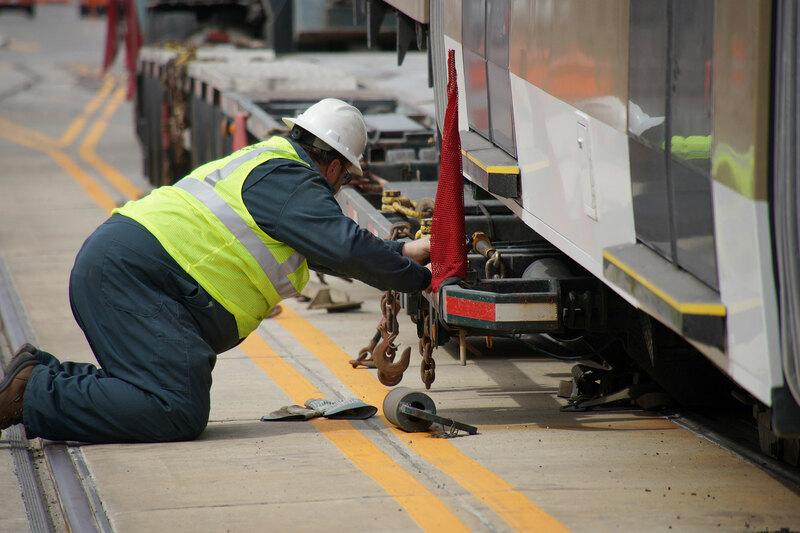 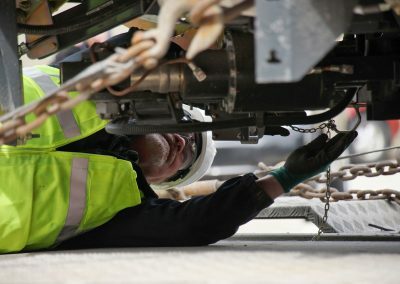 After the final vehicle assembly and completion of the railway system, one thousand kilometers of route testing must be completed to comply with federal mandates. 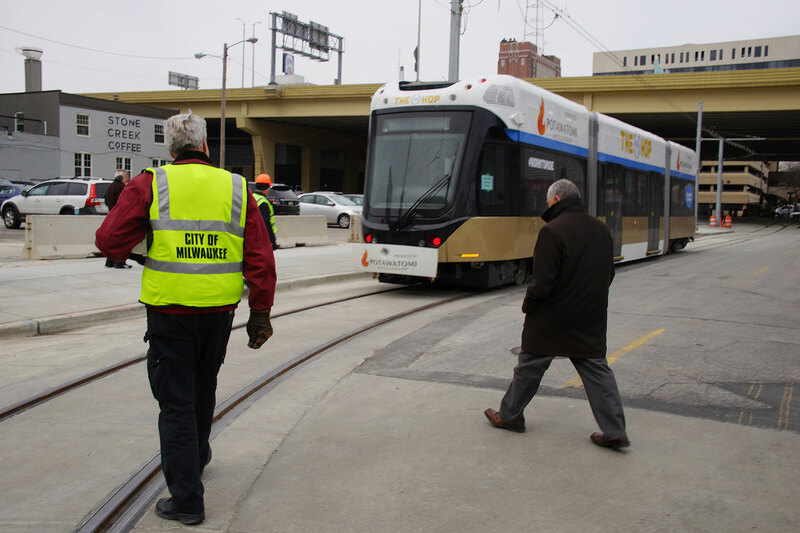 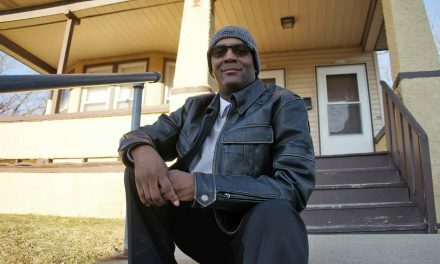 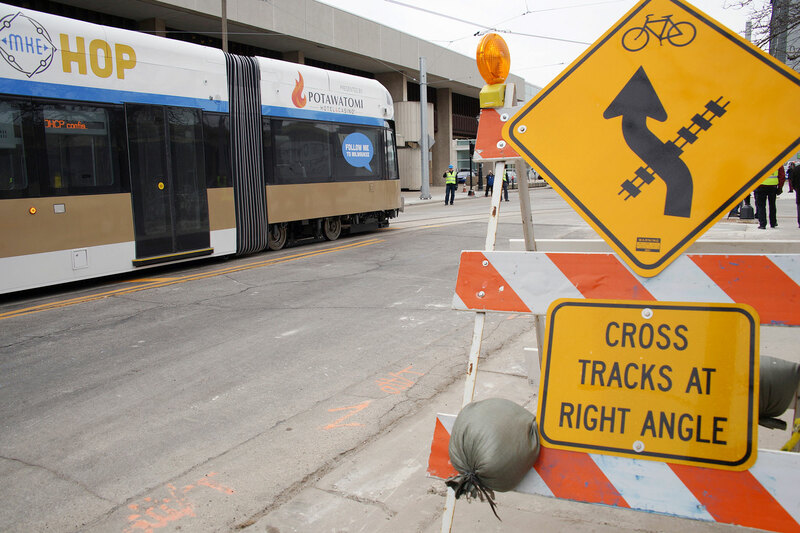 The maneuver was celebrated as the first time a streetcar has moved along the surface of a Milwaukee street for almost 60 years to the day, when the city’s last streetcar route was closed in the early morning hours of Sunday, March 2, 1958. 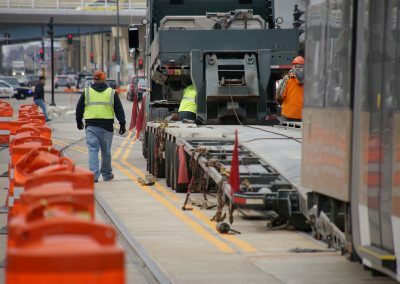 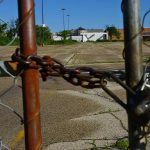 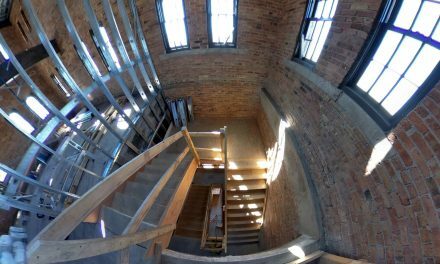 Streetcar operations once covered over 191 miles of Milwaukee streets. 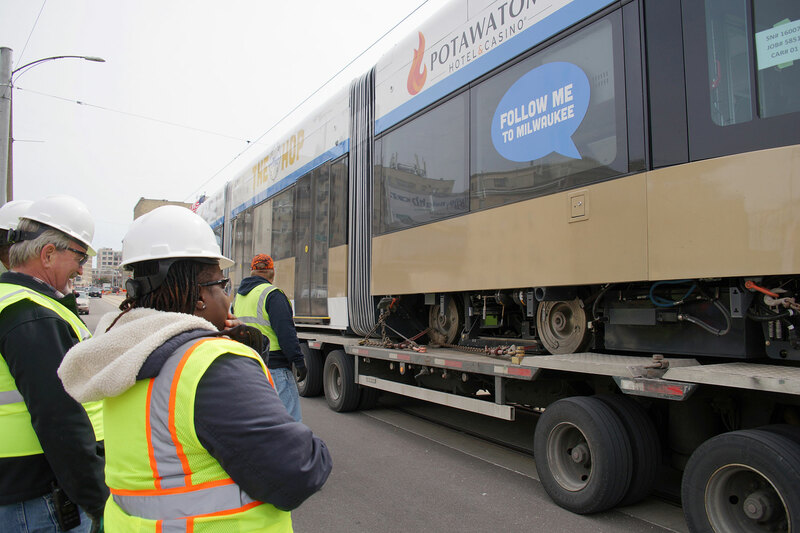 Portions of the original #10 Line on Ogden and Jackson Street will again see streetcar service as part of the modern system’s starter line. The delivery also featured the official reveal of the streetcar fleet’s color scheme. 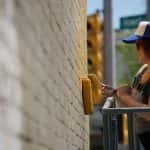 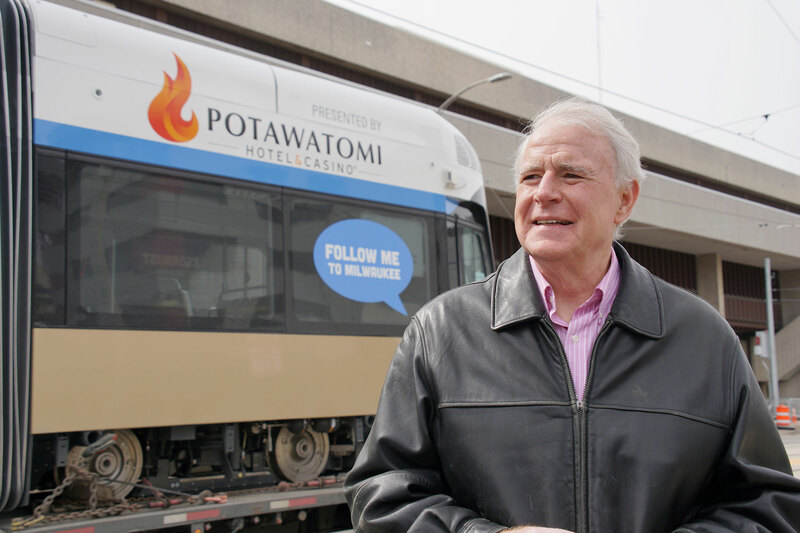 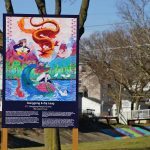 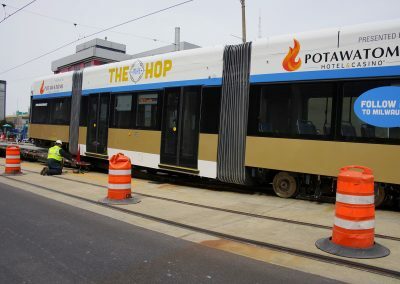 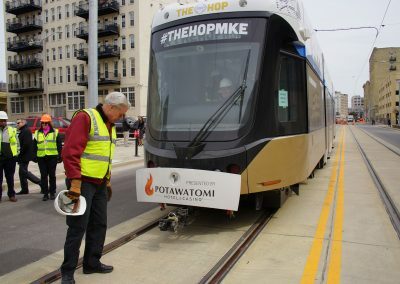 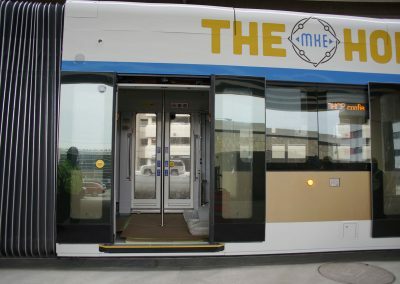 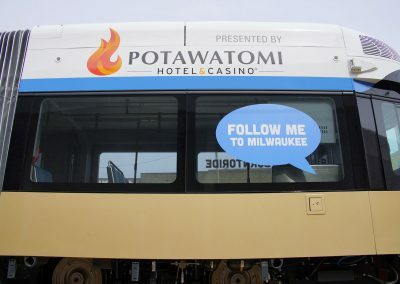 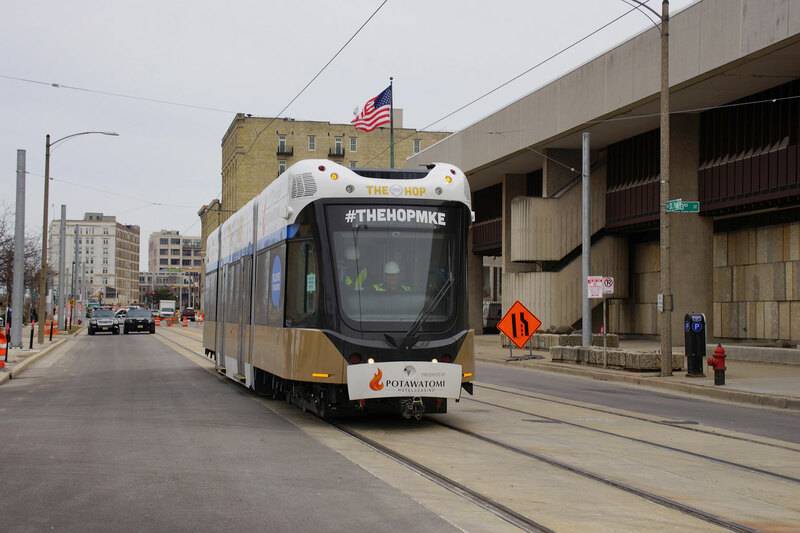 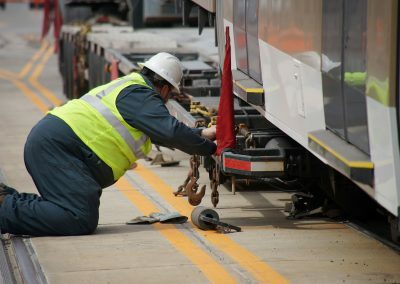 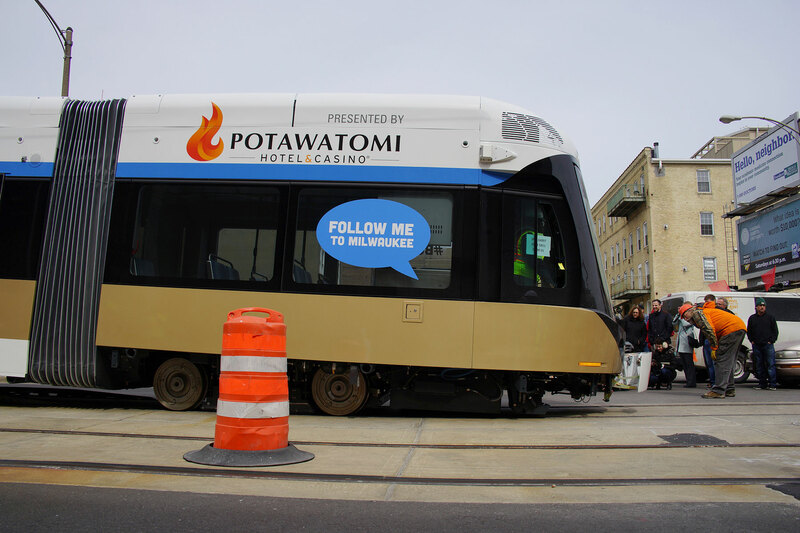 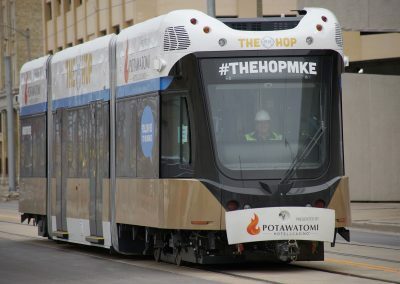 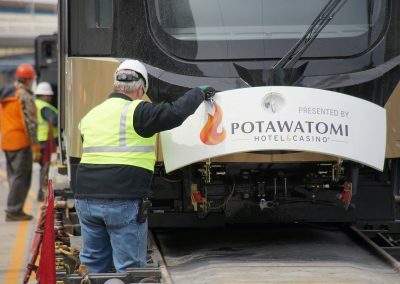 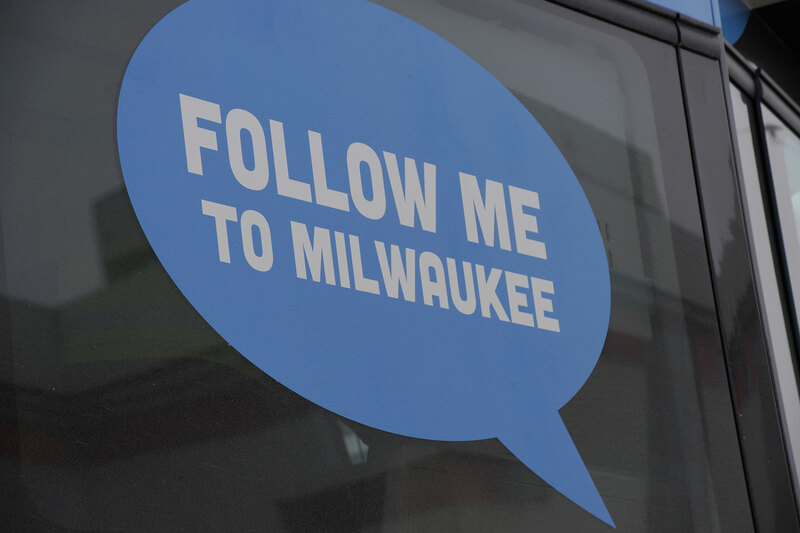 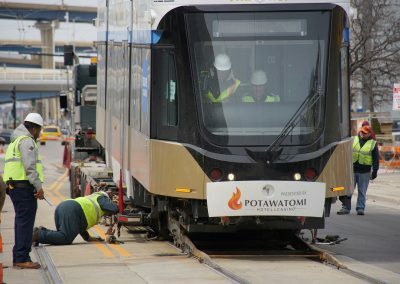 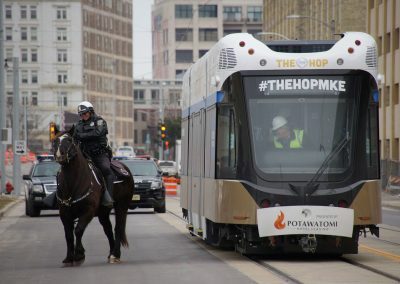 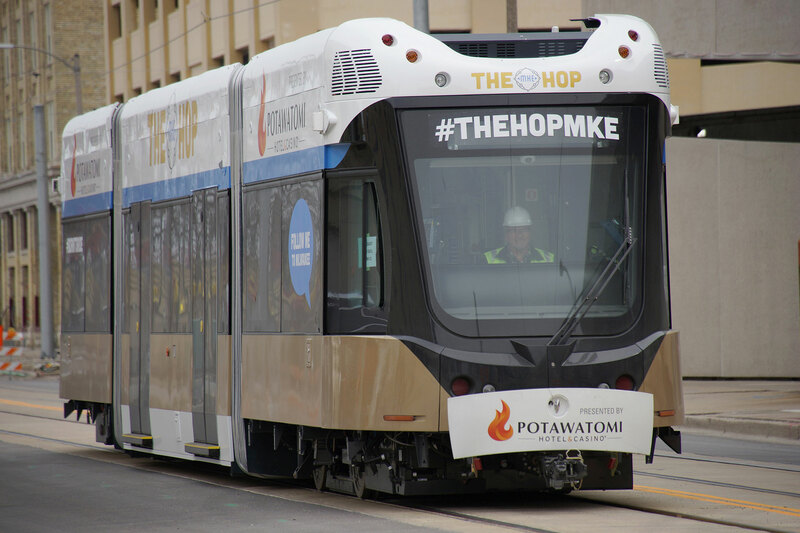 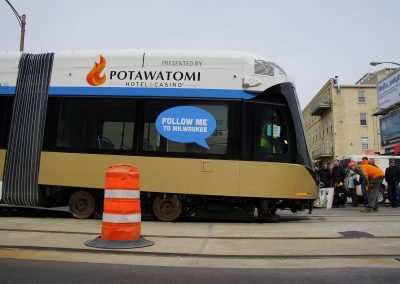 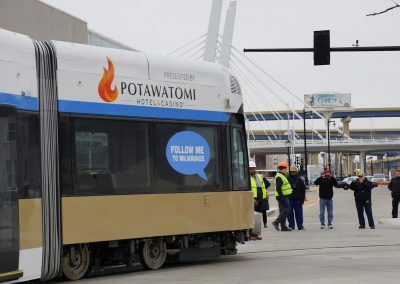 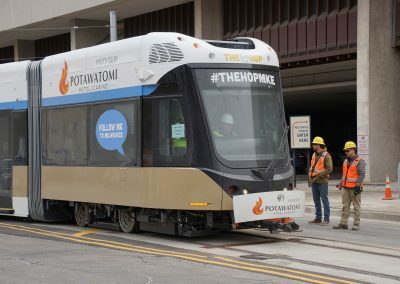 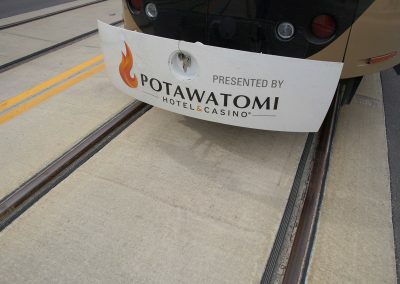 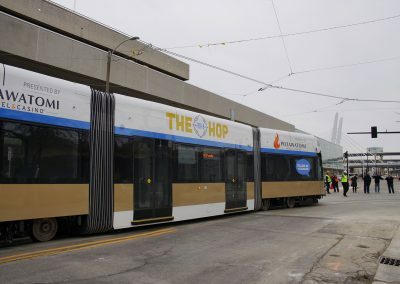 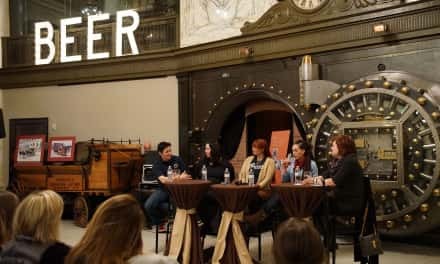 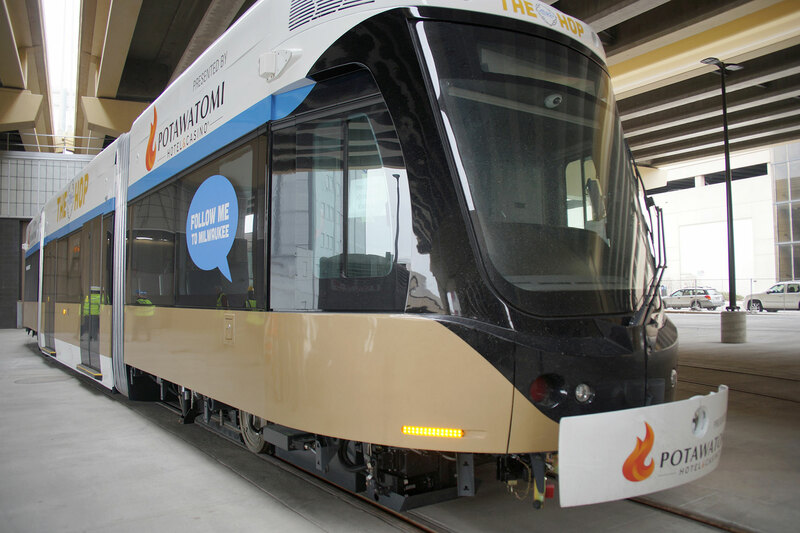 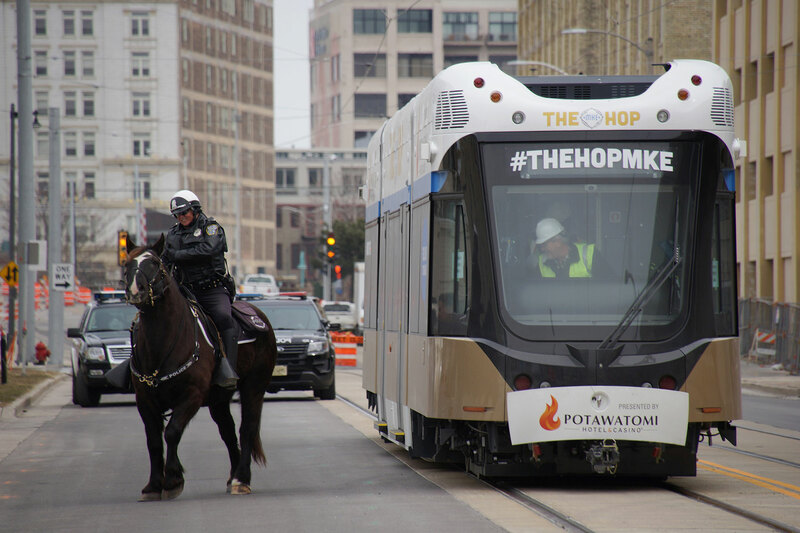 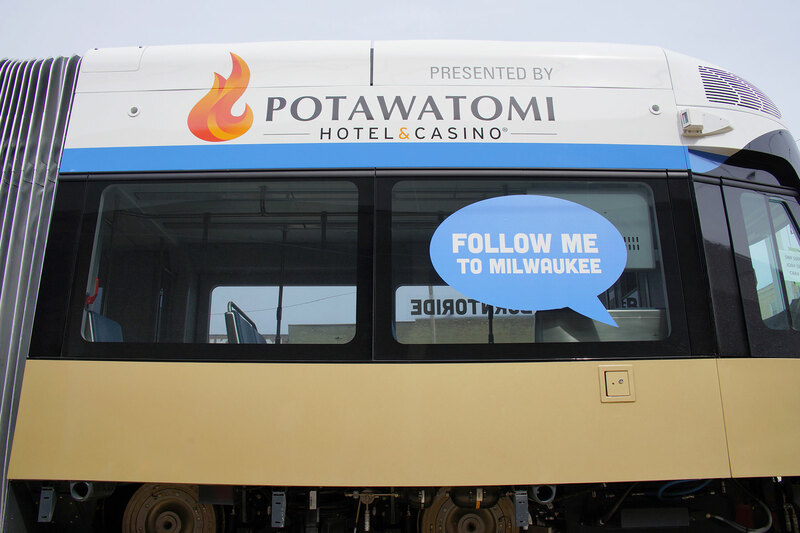 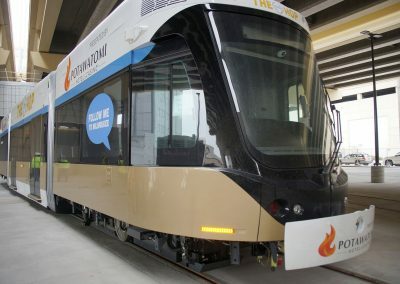 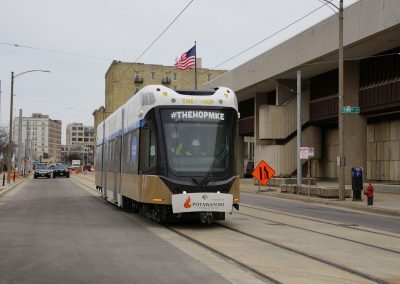 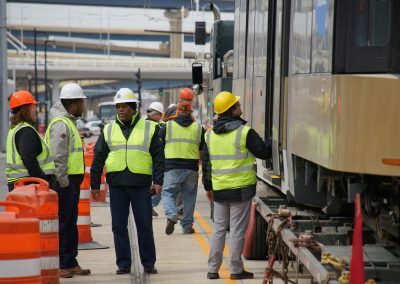 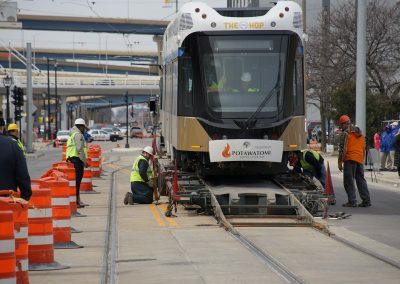 While other Milwaukee TV new stations spotted the vehicle en route to Milwaukee, the general public was not aware of how the streetcar was painted until photographs of its arrival began to flood social media.